2012-04-23 First worldwide family litigation filed litigation Critical https://patents.darts-ip.com/?family=42664937&utm_source=google_patent&utm_medium=platform_link&utm_campaign=public_patent_search&patent=CN102438590(B) "Global patent litigation dataset” by Darts-ip is licensed under a Creative Commons Attribution 4.0 International License. 本发明涉及新的包含活性剂的水包油型乳液泡沫气雾剂组合物，其用于治疗各种慢性和急性皮肤病症，特别是痤疮和牛皮癣；且涉及制备该乳液泡沫气雾剂组合物的方法。 The present invention relates to novel oil-in-water emulsion aerosol foam composition comprising an active agent for the treatment of various chronic and acute skin conditions, particularly acne and psoriasis; and relates to the preparation of an emulsion aerosol foam composition Methods. 特别是，本发明涉及在油相中包含类维生素A的水包油型乳液泡沫气雾剂组合物。 In particular, the present invention relates to oil-in-water emulsion aerosol foam composition comprising a retinoid in an oil phase of A. [0001 ] 本发明涉及新的泡沫气雾剂组合物，其包含用于治疗皮肤疾病的药物活性剂。  The present invention relates to novel aerosol foam composition comprising a pharmaceutically active agent for the treatment of skin diseases. 在局部药物递送方面有许多挑战。  There are many challenges in terms of local drug delivery. 该局部组合物应递送活性剂至治疗部位，具有理想的感觉特征，不在皮肤表面残留令人不快的残余物，且不引起刺激或不适。 The topical composition should deliver the active agent to the treatment site, having desirable sensory characteristics, not remaining on the surface of the skin was unpleasant residue, and does not cause irritation or discomfort. 已知泡沫气雾剂(aerosol foam)适合于该目的。 Known aerosol foam (aerosol foam) suitable for this purpose. Callaghan等人的美国专利N0.7，387，807公开了局部组合物，其包含野甘菊提取物、药物赋形剂，化妆试剂，和其它生物活性物质，如类维生素A。  Callaghan et al., U.S. Patent No. N0.7,387,807 discloses a topical composition comprising a feverfew extract, a pharmaceutical excipient, a cosmetic agent, and other biologically active substances, such as retinoids A. 该组合物可以是乳液如乳膏或洗剂的形式。 The composition may be in the form of an emulsion such as a cream or lotion. Angel等人的美国专利N0.7，326，408公开了局部治疗痤疮的组合物，其包含一种或多种遮光剂和抗细菌药物，其中该组合物可以是凝胶、喷雾剂、泡沫、洗剂的形式或其它适合施用于皮肤的形式。  Angel et al., U.S. Patent No. N0.7,326,408 discloses topical acne treatment compositions comprising one or more opacifying agents and antibacterial drugs, wherein the composition may be a gel, spray , foams, lotions, or other forms suitable for application to the skin. 该组合物可进一步包括其他抗痤疮药物，如类维生素A (例如维甲酸，阿达帕林或他扎罗汀)。 The composition may further comprise other anti-acne medications such as vitamin A (e.g. tretinoin, adapalene or tazarotene). Abram的美国专利N0.6，730，288描述了泡沫气雾剂组合物，其包含有效量的药物活性成分、闭塞剂、水性溶剂、有机共溶剂，所述药物活性成分在水和闭塞剂中都不溶，且闭塞剂存在的量足以在使用时在皮肤上形成闭塞层。  U.S. Patent No. Abram N0.6,730,288 described in aerosol foam composition comprising an effective amount of a pharmaceutically active ingredient, occlusive agents, aqueous solvents, organic co-solvent, the pharmaceutically active ingredient in water and occluding agent is not soluble, and present in an amount sufficient to form a blocking agent occlusive layer on the skin during use. Abram等人的美国公开的申请N0.2006/0292080描述了水包油型泡沫乳液(emulsion foam)，包含:溶于水相的维生素或其类似物和溶于油相的稳定剂、乳化剂、闭塞剂、和有机共溶剂，且没有描述油相的颗粒尺寸。  Abram et al., U.S. Application Publication N0.2006 / 0292080 describes oil-in-water emulsion foam (emulsion foam), comprising: phase water-soluble vitamins were dissolved in the oil phase or an analogue thereof and a stabilizer, emulsifying agents, occluding agents, organic co-solvents, and does not describe the particle size of the oil phase. Larm等人的美国公开的申请N0.2006/0057168描述了制备水包油型微乳液或亚微乳液组合物，特别是水包油型微乳液或亚微乳液泡沫组合物的方法。  Larm et al., U.S. Application Publication N0.2006 / 0057168 described oil in water microemulsion or sub-prepared microemulsion composition, in particular oil-in-water microemulsion or microemulsion method alkylene foam composition. 这些亚微乳液或微乳液泡沫具有较高的油含量且需要亲水性和疏水性表面活性剂两者。 These submicron emulsion or microemulsion foam having a higher oil content and require both a hydrophilic and a hydrophobic surfactant. 本发明涉及低油和低表面活性剂的包含药物活性剂的亚微乳液或微乳液泡沫气雾剂，其为化妆优异的、化学和物理稳定的、良好耐受的，容易配制的，和适合施用于脸的。  The present invention relates to low fat and low surfactant comprising a pharmaceutically active agent submicron emulsion or microemulsion aerosol foam, which is excellent in makeup, chemically and physically stable, well tolerated, easily formulated , and suitable for application to the face. 本发明涉及具有油相和水相的水包油型乳液泡沫气雾剂组合物(aerosol foamcomposition),所述组合物包含药物活性剂、水、油、油可混溶的有机溶剂、表面活性剂和推进剂。  The present invention relates to an oil phase and a water phase having oil in water type emulsion aerosol foam composition (aerosol foamcomposition), said composition comprising a pharmaceutically active agent, water, oil, oil-miscible organic solvent, a surfactant and a propellant. 本发明提供在水包油型乳液泡沫气雾剂组合物中的低油和低表面活性剂含量。 The present invention provides an oil-in-water type emulsion aerosol foam composition of low oil content and low surfactant. 推进剂；且其中所述药物活性剂溶解于该组合物的油相中，且其中油相的颗粒尺寸小于约lOOOnm。  The propellant; and wherein the pharmaceutically active agent is dissolved in the oil phase of the composition, and wherein the particle size of the oil phase is less than about lOOOnm. e)用推进剂推进亚微或微水包油型乳液的样品以形成水包油型亚微乳液或微乳液泡沫气雾剂。  e) promote the submicron or micro sample oil in water type emulsion with a propellant to form an oil-in-water submicron emulsion or microemulsion aerosol foam. 根据一个实施方案，本发明提供通过该方法制备的产物。  According to one embodiment, the present invention provides a product prepared by this method. 根据另一实施方案，本发明提供治疗皮肤疾病、障碍或病症的方法，包括向需要该治疗的患者皮肤给药有效量的本发明的组合物。  According to another embodiment, the present invention provides a method of treating skin diseases, disorders, or conditions, including composition of the invention is transdermal administration to a patient in need of such treatment an effective amount. 根据另一实施方案，本发明涉及本文所述的组合物在制备用于治疗皮肤疾病、障碍或病症的药物中的用途。  According to another embodiment, the present invention relates to compositions described herein in the manufacture of a medicament for the treatment of skin disease, disorder or condition is used. 图1为说明本发明一个优选实施方案的示意流程图，其中制备低油和低表面活性剂含量的水包油型亚微乳液或微乳液泡沫气雾剂组合物(730/2/1)。  FIG. 1 is a schematic flow diagram illustrating a preferred embodiment of the invention, wherein the preparation of low oil content and low surface active agent, oil-in-water submicron emulsion or microemulsion aerosol foam composition (730/2 / 1). 该方法详细描述于实施例I。 The method described in detail in Example I. 图2说明与可商购的他扎罗汀乳膏和凝胶制剂(即TAZORAC®乳膏和凝胶)相t匕，施用本发明的他扎罗汀制剂(706/8/2和706/8/3)后表皮中他扎罗汀的分布。  tazarotene cream and gel formulations described in FIG. 2 and commercially available (i.e. TAZORAC® creams and gels) with t dagger administered formulation of the present invention, tazarotene (706/8/2 and 706/8/3) after distribution of epidermis of tazarotene. 图3说明与可商购的他扎罗汀乳膏和凝胶制剂(即TAZORAC®乳膏和凝胶)相t匕，施用本发明的他扎罗汀制剂(706/8/2和706/8/3)后真皮中的他扎罗汀分布。  Figure 3 illustrates a commercially available with a tazarotene cream and gel formulations (i.e. TAZORAC® creams and gels) with t dagger administered formulation of the present invention, tazarotene (706/8/2 and after 706/8/3) dermis tazarotene distribution. 图4说明高HLB的乙氧基化脂肪醇醚表面活性剂与他扎罗汀的相容性(他扎罗汀稳定性)。  Figure 4 illustrates the compatibility of high HLB ethoxylated fatty alcohol ether surfactant Tazarotene (tazarotene stability). 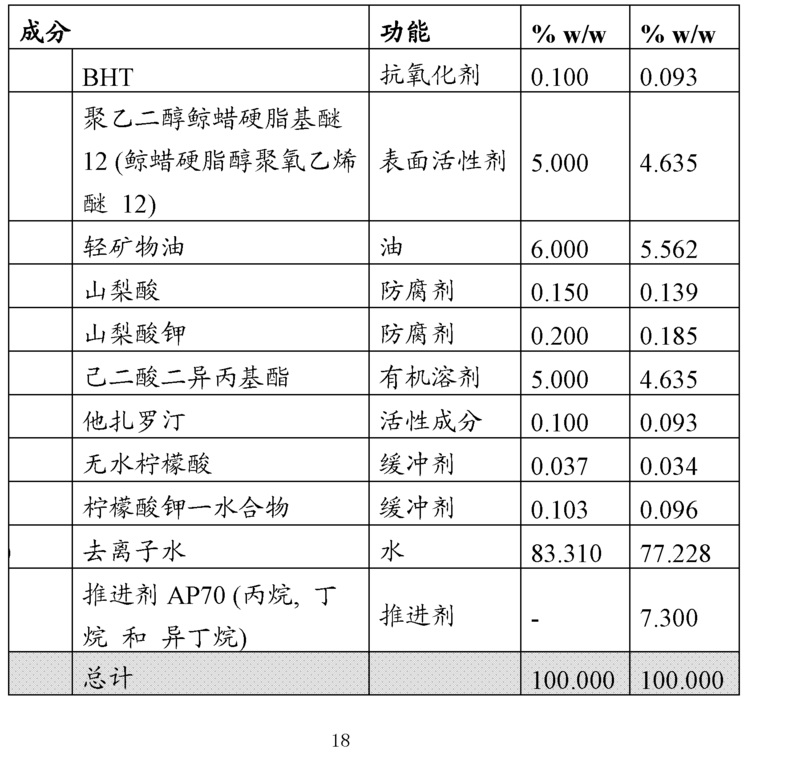 与各种低HLB表面活性剂进行比较。 Compared to various low HLB surfactant. 图5说明高HLB的乙氧基化脂肪醇醚表面活性剂与他扎罗汀的相容性(他扎罗汀亚砜(sulfoxide)形成)。  Figure 5 illustrates the compatibility of high HLB ethoxylated fatty alcohol ether surfactant Tazarotene (tazarotene sulfoxide (sulfoxide) is formed). 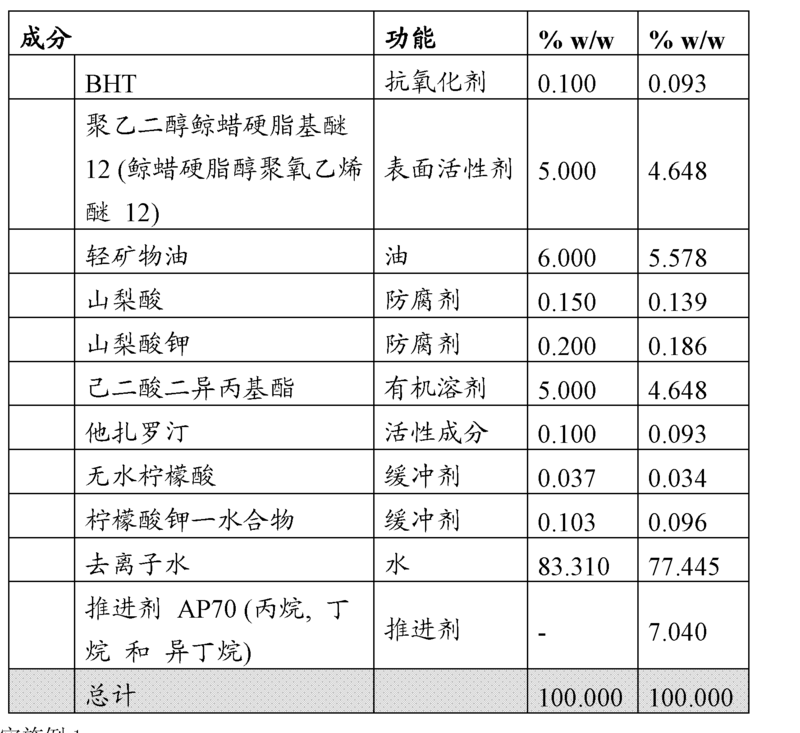 与各种低HLB表面活性剂进行比较。 Compared to various low HLB surfactant. 图6说明本发明亚微乳液或微乳液的油相的颗粒尺寸分布(730/2/1)。  Figure 6 illustrates the particle size of the oil present Minya microemulsion or microemulsion phase distribution (730/2/1). 本发明涉及具有油相和水相的水包油型乳液泡沫气雾剂组合物，所述组合物包含药物活性剂、水、油、油可混溶的有机溶剂、表面活性剂、和推进剂。  The present invention relates to an oil phase and an aqueous phase having a water-oil-emulsion aerosol foam composition, the combination of pharmaceutically active agents, water, oil, oil-miscible organic solvent, a surface active agent comprises, and propellants. 在一个实施方案中，本发明提供低油和低表面活性剂含量的水包油型乳液泡沫气雾剂组合物。 In one embodiment, the present invention provides a low oil content and low surface active agent, oil in water type emulsion aerosol foam composition. 根据另一实施方案，该组合物配制成亚微乳液或微乳液。 According to another embodiment, the composition is formulated into a submicron emulsion or microemulsion. 推进剂；且其中所述药物活性剂溶解于组合物的油相中，且其中油相的颗粒尺寸小于约lOOOnm。  The propellant; and wherein the pharmaceutically active agent is dissolved in the oil phase of the composition, and wherein the particle size of the oil phase is less than about lOOOnm. 该油和油可混溶的有机溶剂以及任何油可混溶的赋形剂一起构成组合物的油相。  The oil and oil-miscible organic solvent, miscible oils, and any excipients constituting the oil phase of the composition. 根据一个实施方案，油相的平均颗粒尺寸为约lOOnm。  According to one embodiment, the average particle size of the oil phase is from about lOOnm. 在一个可选实施方案中，所述药物活性剂溶解于组合物的水相中。  In an alternative embodiment, the pharmaceutically active agent is dissolved in the aqueous phase of the composition. 适当地，油在组合物中存在的量为约1%至约9重量％。  Suitably, the oil present in the composition in an amount from about 1% to about 9% by weight. 在另一实施方案中，油的存在量为约3%至约8重量％，如约3%，4%，5%，6%，7%或8重量％。 In another embodiment, the oil is present in an amount of from about 3% to about 8 wt%, such as about 3%, 4%, 5%, 6%, 7%, or 8 wt%. 所述油在水包油型乳液体系的不连续相中。 The  the oil discontinuous phase of the oil in water type emulsion system. 在一个实施方案中，所述油为烃。 In one embodiment, the oil is a hydrocarbon. 适当地，所述烃选自芳族化合物，或直链、支链的或环状烷烃或烯烃，或其混合物。 Suitably, the hydrocarbon is selected from aromatic compounds, or a straight-chain, branched or cyclic alkane or alkene, or mixture thereof. 根据一个实施方案，所述芳族化合物选自甘菊环，菊奥和环亚己基-二苯基甲烷，及其混合物。  According to one embodiment, the aromatic compound is selected azulene, Austria and daisy-cyclohexylidene - diphenylmethane, and mixtures thereof. 根据另一实施方案，该直链、支链的或环状烷烃或烯烃选自异链烷烃(isoparaffin)，二癸烯，二乙基己基环己烷，二十烷，异十二烷，异二十烷，异十六烷，长叶烯，矿物油，石蜡(paraffin)，五氢角鲨烯，矿脂，角鲨烷，角鲨烯，十四烯，其衍生物，及其混合物. 根据一个实施方案，所述油为矿物油。  According to another embodiment, the linear, or cyclic alkane or alkene selected from isoparaffins (Isoparaffin), di-decene, diethylhexyl cyclohexane, eicosane branched, isododecane alkoxy, isoeicosane, isohexadecane, longifolene, mineral oil, paraffin wax (Paraffin), pentahydrosqualene squalene, petrolatum, squalane, squalene, tetradecene, derivatives thereof, and mixtures thereof. according to one embodiment, the oil is a mineral oil. 在一个实施方案中，矿物油的存在量为约1%至约9重量％。 In one embodiment, the mineral oil is present in an amount of from about 1% to about 9% by weight. 在另一实施方案中，矿物油的存在量为约3%至约8重量％，如约3%，4%，5%，6%，7%或8 重量％。 In another embodiment, the mineral oil is present in an amount of from about 3% to about 8 wt%, such as about 3%, 4%, 5%, 6%, 7%, or 8 wt%. 在另一实施方案中，所述油为植物油。  In another embodiment, the oil is a vegetable oil. 适当地，该植物油选自棕榈油，大豆油，菜籽油，向日葵油，花生油，玉米油，橄榄油，椰子油，棉子油，亚麻子油，葡萄子油，榛子油或芝麻油，及其混合物。 Suitably, the vegetable oil is selected from palm oil, soybean oil, rapeseed oil, sunflower oil, peanut oil, corn oil, olive oil, coconut oil, cottonseed oil, linseed oil, grapeseed oil, hazelnut oil, or sesame oil, and mixture. 本发明的局部泡沫组合物包含表面活性剂成分。 Topical foam composition  The present invention comprises a surfactant component. 适当地，该表面活性剂在组合物中存在的量为约1%至约8重量％。 Suitably, the surfactant is present in the composition in an amount of from about 1% to about 8% by weight. 在另一实施方案中，该表面活性剂的存在量为约2%至约6重量％，如约2%，3%，4%，5%或6重量％。 In another embodiment, the surfactant is present in an amount of from about 2% to about 6 wt%, such as about 2%, 3%, 4%, 5%, or 6 wt%. 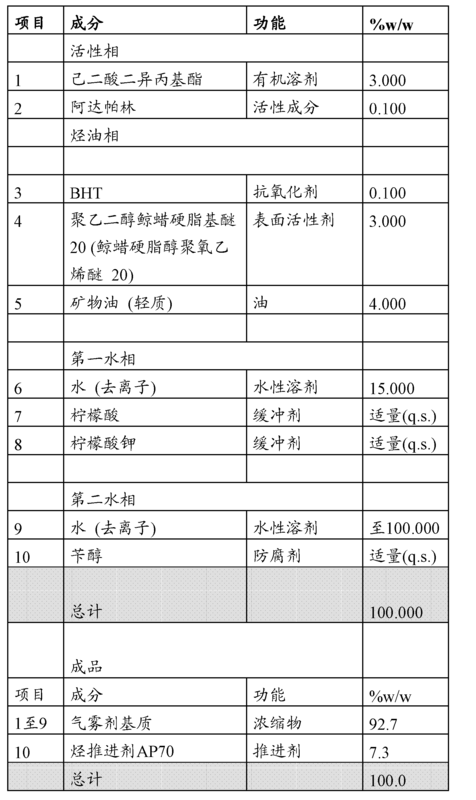 表面活性剂的亲水性/亲油性平衡(HLB)描述表面活性剂对水或油的亲和力。  The hydrophilic surfactant / lipophilic balance (HLB) surfactants described affinity for water or oil. HLB标度范围为I (完全亲脂的)至20 (完全亲水的)，且10表示两个特征的均衡。 HLB scale ranges I (completely lipophilic) to 20 (completely hydrophilic), and 10 denotes a balanced two features. 亲油性表面活性剂倾向于形成油包水型(w/o)乳液，且亲水性表面活性剂倾向于形成水包油型(o/w)乳液。 Lipophilic surfactants tend to form a water-in-oil (w / o) emulsion, and a hydrophilic surfactant tends to form an oil-in-water (o / w) emulsion. 两种表面活性剂的混合物的HLB等于表面活性剂A的重量分数乘其HLB值加上表面活性剂B的重量分数乘其HLB值(加权平均值)。 HLB surfactant is a mixture of two surfactants equal to A multiplied by the weight fraction having an HLB value plus the weight fraction of surfactant B whose HLB value is multiplied (weighted average). 在一个实施方案中，该表面活性剂成分包含亲水性表面活性剂。  In one embodiment, the surfactant component comprises a hydrophilic surfactant. 在另一实施方案中，该表面活性剂成分由单一亲水性表面活性剂组成，且在另一实施方案中，该表面活性剂成分包含多于一种表面活性剂且它们HLB值的加权平均值为约10至约20。 In another embodiment, the surfactant component consists of a single hydrophilic surfactant, and in another embodiment, the surfactant component comprises more than one surfactant and the weighted average of their HLB values value of from about 10 to about 20. 在另一实施方案中，该表面活性剂成分由非离子表面活性剂组成。 In another embodiment, the surfactant component of a non-ionic surfactant. 合适的非离子表面活性剂包括但不限于乙氧基化脂肪醇醚，PEG衍生物，乙氧基化脂肪酸，丙二醇酯，脂肪醇，甘油酯和衍生物，聚醚和脱水山梨醇酯，及其混合物。  Suitable nonionic surfactants include, but are not limited to ethoxylated fatty alcohol ethers, PEG derivatives, ethoxylated fatty acids, propylene glycol esters, fatty alcohols, glycerides and derivatives, polyethers and sorbitan esters, and mixtures thereof. 在一个实施方案中，所述亲水性乙氧基化脂肪醇醚选自硬脂醇聚氧乙烯醚-10，硬脂醇聚氧乙烯醚-20，鲸蜡硬脂醇聚氧乙烯醚-10，鲸蜡硬脂醇聚氧乙烯醚-12，鲸蜡硬脂醇聚氧乙烯醚-15，鲸蜡硬脂醇聚氧乙烯醚-20，鲸蜡硬脂醇聚氧乙烯醚-21，鲸蜡硬脂醇聚氧乙烯醚-22，鲸蜡硬脂醇聚氧乙烯醚-25，鲸蜡硬脂醇聚氧乙烯醚-30，鲸蜡硬脂醇聚氧乙烯醚-31，鲸蜡硬脂醇聚氧乙烯醚-32，鲸蜡硬脂醇聚氧乙烯醚-33，鲸蜡硬脂醇聚氧乙烯醚_6，月桂基聚氧乙烯醚_5，月桂基聚氧乙烯醚_9，月桂基聚氧乙烯醚-10，月桂基聚氧乙烯醚-12，月桂基聚氧乙烯醚-15，月桂基聚氧乙烯醚-20，月桂基聚氧乙烯醚-21，月桂基聚氧乙烯醚-22，月桂基聚氧乙烯醚-23，壬基酚聚氧乙烯醚-9，油基聚氧乙烯醚-10和油基聚氧乙烯醚-20。  In one embodiment, the hydrophilic ethoxylated fatty alcohol ethers of stearyl alcohol is selected from -10 polyoxyethylene ether, stearyl polyoxyethylene ether -20, polyoxyethylene cetyl stearyl alcohol -10 vinyl ether, cetyl ether, polyoxyethylene stearyl alcohol-12, ceteareth -15 polyoxyethylene ethers, cetostearyl alcohol -20 polyoxyethylene ethers, cetostearyl alcohol polyoxyethylene ethers -21, cetearyl alcohol polyoxyethylene ethers-22, ceteareth -25 polyoxyethylene ethers, cetostearyl alcohol -30 polyoxyethylene ethers, cetostearyl alcohol polyoxyethylene ethers -31 , ceteareth -32 polyoxyethylene ethers, cetostearyl alcohol -33 polyoxyethylene ethers, cetostearyl alcohol _6 polyoxyethylene ethers, polyoxyethylene lauryl ether _5, laureth _9 vinyl ether, polyoxyethylene lauryl ether, -10, polyoxyethylene lauryl ether 12, polyoxyethylene lauryl ether, -15, polyoxyethylene lauryl ether, -20, polyoxyethylene lauryl ether -21 polyoxyethylene lauryl ether -22, polyoxyethylene lauryl ether, -23, -9 polyoxyethylene nonylphenyl ether, polyoxyethylene oleyl ether, -10 and polyoxyethylene oleyl ether -20. 在另一实施方案中，其中所述亲水性乙氧基化脂肪醇醚为聚乙二醇鲸蜡硬脂基醚12 (鲸蜡硬脂醇聚氧乙烯醚-12)。  In another embodiment, wherein the hydrophilic ethoxylated fatty alcohol ethers of polyethylene glycol cetearyl ether 12 (cetyl stearyl alcohol polyoxyethylene ethers -12). 在一个实施方案中，该聚乙二醇鲸蜡硬脂基醚12在组合物中存在的量为约1%至约8重量％。 In one embodiment, the polyethylene glycol ether of cetearyl 12 present in the composition in an amount from about 1% to about 8% by weight. 在另一实施方案中，该聚乙二醇鲸蜡硬脂基醚12的存在量为约2%至约6重量％，如约2%，3%，4%，5%或6重量％。 In another embodiment, the polyethylene glycol cetostearyl ether 12 was present in an amount from about 2% to about 6 wt%, such as about 2%, 3%, 4%, 5%, or 6 wt%. 示例性PEG(聚氧乙烯)衍生物包括PEG-7氢化蓖麻油，PEG-25氢化蓖麻油，PEG-30蓖麻油，PEG-31蓖麻油，PEG-32蓖麻油，PEG-33蓖麻油，PEG-34蓖麻油，PEG-35蓖麻油，PEG-40氢化蓖麻油，PEG-50蓖麻油和PEG-60氢化蓖麻油。  Exemplary PEG (poly ethylene oxide) derivatives include PEG-7 hydrogenated castor oil, PEG-25 hydrogenated castor oil, PEG-30 castor oil, PEG-31 castor oil, PEG-32 castor oil, PEG-33 castor sesame oil, PEG-34 castor oil, PEG-35 castor oil, PEG-40 hydrogenated castor oil, PEG-50 castor oil and PEG-60 hydrogenated castor oil. 示例性乙氧基化脂肪酸包括PEG-5油酸酯，PEG-6油酸酯，PEG-10油酸酯，PEG-6硬脂酸酯，PEG-8硬脂酸酯和PEG-9硬脂酸酯，PEG-20硬脂酸酯，PEG-40硬脂酸酯，PEG-41硬脂酸酯，PEG-42硬脂酸酯，PEG-43硬脂酸酯，PEG-44硬脂酸酯，PEG-45硬脂酸酯，PEG-46硬脂酸酯，PEG-47硬脂酸酯，PEG-48硬脂酸酯，PEG-49硬脂酸酯，PEG-50硬脂酸酯和PEG-100硬脂酸酯。  Exemplary ethoxylated fatty acids include PEG-5 oleate, PEG-6 oleate, PEG-10 oleate, PEG-6 stearate, PEG-8 stearate and PEG- 9 stearate, PEG-20 stearate, PEG-40 stearate, PEG-41 stearate, PEG-42 stearate, PEG-43 stearate, PEG-44 hard aliphatic acid esters, PEG-45 stearate, PEG-46 stearate, PEG-47 stearate, PEG-48 stearate, PEG-49 stearate, PEG-50 stearate esters and PEG-100 stearate. 示例性丙二醇酯包括丙二醇棕榈酸酯和丙二醇硬脂酸酯。  Exemplary glycol esters include propylene glycol palmitate and stearate. 示例性脂肪醇包括鲸蜡醇和硬脂醇。  Exemplary fatty alcohols include cetyl alcohol and stearyl alcohol. 示例性聚醚包括泊洛沙姆124，泊洛沙姆182，泊洛沙姆184，泊洛沙姆188，泊洛沙姆237，泊洛沙姆331，泊洛沙姆338和泊洛沙姆407。  Exemplary polyethers include poloxamer 124, poloxamer 182, poloxamer 184, poloxamer 188, poloxamer 237, poloxamer 331, and poloxamer 338 poises poloxamer 407. 示例性脱水山梨醇衍生物包括脱水山梨醇聚氧乙烯(20)醚月桂酸酯，脱水山梨醇聚氧乙烯(20)醚棕榈酸酯，脱水山梨醇聚氧乙烯(20)醚硬脂酸酯，聚山梨酯80，脱水山梨醇月桂酸酯，脱水山梨醇油酸酯，脱水山梨醇棕榈酸酯，脱水山梨醇倍半油酸酯，脱水山梨醇硬脂酸酯和脱水山梨醇三油酸酯。  Exemplary sorbitan derivatives including sorbitan polyoxyethylene (20) ether laurate, sorbitan polyoxyethylene (20) ether palmitate, sorbitan polyoxyethylene (20) ether Hard aliphatic acid esters, polysorbate 80, sorbitan monolaurate, sorbitan monooleate, sorbitan monopalmitate, sorbitan sesquioleate, sorbitan stearate and sorbitan trioleate. 在一个实施方案中，该表面活性剂成分包含一种或多种亲水性非离子表面活性剂且基本上不含，或不含亲油性表面活性剂。  In one embodiment, the surfactant component comprises one or more hydrophilic nonionic surfactant and substantially free, or free of lipophilic surfactant. 根据一个实施方案，该表面活性剂成分基本上不含，或不含脂肪醇。 According to one embodiment, the surfactant component is substantially free, or free of fatty alcohols. 在一个实施方案中，该表面活性剂成分包含亲水性乙氧基化脂肪醇醚。  In one embodiment, the surfactant component comprises a hydrophilic ethoxylated fatty alcohol ether. 在另一实施方案中，所述表面活性剂成分包含亲水性乙氧基化脂肪醇醚，且基本上不含，或不含亲油性表面活性剂。 In another embodiment, the surfactant component comprises a hydrophilic ethoxylated fatty alcohol ethers, and is substantially free, or free of lipophilic surfactant. 药物活性剂 适当地，用于本文的组合物的药物可接受的活性剂选自类维生素A，视黄酸代谢阻滞剂(RAMBAs)，免疫应答调节化合物，维生素D类似物，皮质类固醇，抗组胺剂，抗细菌剂，抗真菌剂，抗病毒剂，细胞毒素剂，补骨脂素，抗脱发剂，抗雄激素，止痒剂，角质层分离剂，焦油，地蒽酚，防腐剂，遮光剂，麻醉剂，镇痛剂，皮肤调节剂和营养剂，其盐，其衍生物及其混合物。  The pharmaceutically active agent  Suitably, the pharmaceutical compositions used herein pharmaceutically active agent is selected from the class of vitamin A, retinoic acid metabolism blockers (RAMBAs), immune response modifier compound, similar to vitamin D thereof, corticosteroids, antihistamines, antibacterial agents, antifungal agents, antiviral agents, cytotoxic agents, psoralen, anti-alopecia agents, anti-androgens, antipruritic agents, keratolytic agents, tar, dithranol, preservatives, opacifying agents, anesthetics, analgesics, skin conditioners and nutrients, salts, derivatives and mixtures thereof. 在一个实施方案中，该组合物可包含多于一种药物活性剂，其盐或衍生物。 In one embodiment, the composition may comprise more than one pharmaceutically active agent, salts or derivatives thereof. 药物活性剂的合适的浓度范围为约0.001%至约30重量％，取决于活性剂或活性剂组合的性质。 Suitable pharmaceutically active agent concentration ranges from about 0.001% to about 30% by weight, depending on the nature of the active agent or combination of active agents. 5-(2-(4，4_ 二甲基硫代色满-6-基)乙炔基)噻吩-2-羧酸乙酯，6-(2-4，4-二甲基硫代色满_6_基)-乙块基)-3_卩比唳基甲醇和6-(2-(4,4- 二甲基硫代色满-6-基)-乙块基)吡啶-3-甲醛，其盐，其衍生物及其混合物。 5- (2- (4,4_-dimethyl thiochroman-6-yl) ethynyl) thiophene-2-carboxylate, 6- (2-4,4- dimethyl-thiochroman _ 6_ yl) - acetylene-yl) -3_ than Jie Li-ylmethanol and 6- (2- (4,4-dimethyl thiochroman-6-yl) - acetylene-yl) pyridine-3-carbaldehyde , its salts, derivatives and mixtures thereof. 在一个实施方案中，所述类维生素A为他扎罗汀。 In one embodiment embodiment, the retinoid is tazarotene A. 在一个可选实施方案中，所述类维生素A为维甲酸。 In an alternative embodiment embodiment, the retinoid is tretinoin A. 在另一实施方案中，该组合物包含类维生素A与第二药物活性剂的组合。 In another embodiment, the composition comprises a retinoid composition A and the second pharmaceutically active agent. 在一个实施方案中，该组合为他扎罗汀和第二药物活性剂。 In one embodiment, the combination of tazarotene and a second pharmaceutically active agent. 在另一实施方案中，该组合为维甲酸和第二药物活性剂。 In another embodiment, the combination of retinoic acid and a second pharmaceutically active agent. 适当地，类维生素A的一个组合为与皮质类固醇的组合，如丙酸氯倍他索；或与维生素D类似物如卡泊三烯的组合；或与抗细菌剂如克林霉素或其药物可接受的盐(例如磷酸克林霉素)的组合。  Suitably, a retinoid composition is a combination of A with a corticosteroid, such as clobetasol propionate; or in combination with vitamin D analogues such as calcipotriene; a or with antibacterial agents such as Clindamycin combination of factors, or a pharmaceutically acceptable salt thereof (e.g. clindamycin phosphate) is. 或者，在一个实施方案中，本发明的组合物包含维甲酸与抗细菌剂，如克林霉素或其药物可接受的盐(例如磷酸克林霉素)的组合。 Alternatively, in one embodiment, the composition of the invention comprises retinoic acid and antibacterial agents, such as combinations of clindamycin or a pharmaceutically acceptable salt thereof (e.g. clindamycin phosphate) is. 组合物中类维生素A的合适的浓度范围包括，例如，约0.001%至约5重量％。 A suitable concentration range of the class  The composition comprises vitamin A, for example, from about 0.001% to about 5% by weight. 在一个实施方案中，所述类维生素A的存在量为约0.01 %至约I %。 In one embodiment, the class of vitamin A is present in an amount of from about 0.01% to about I%. 在另一实施方案中，所述类维生素A的存在量为约0.025 %至约0.5 %。 In another embodiment embodiment, the retinoid is present in an amount A of from about 0.025% to about 0.5%. 在一个实施方案中，当所述类维生素A为他扎罗汀时，其存在量为约0.05%或0.1重量％。 In one embodiment, when the A retinoid tazarotene is present in an amount of about 0.05%, or 0.1 wt%. 在另一实施方案中，当所述类维生素A为维甲酸时，其存在量为约0.025%,0.05%或0.1%。 In another embodiment, when the A retinoid is tretinoin, present in an amount of about 0.025%, 0.05% or 0.1%. 本文使用的作为药物可接受的活性剂的合适视黄酸代谢阻滞剂(RAMBAs)为rambazole。  Suitable retinoic acid metabolism blockers as used herein, pharmaceutically acceptable active agents (RAMBAs) is rambazole. 本文使用的合适的免疫应答调节化合物，免疫抑制剂，免疫调节剂和免疫调控剂包括修饰免疫应答或免疫系统功能的化学或生物衍生的试剂(通过刺激抗体形成或抑制白细胞活性)。  As used herein, a suitable immune response modifier compound, an immunosuppressant, immunomodulatory agents and immunomodulatory agents include modifying the immune response or biological or chemical agent-derived immune system function (formation or inhibiting activity of leukocytes by stimulating antibody). 示例性试剂或化合物包括，但不限于环肽(如环孢菌素)，他克莫司，曲培莫司，批美莫司，西罗莫司(sirolimius)(雷帕霉素)，维罗莫司(verolimus),拉氟莫司，拉喹莫德，麦考酚酸，和咪唑并喹啉胺如咪喹莫特，其盐，其衍生物，及其混合物。 Exemplary agents or compounds include, but are not limited to, cyclic peptides (such as cyclosporin), tacrolimus, song Peimo Division, US batch Mo, sirolimus (sirolimius) (rapamycin), Victoria sirolimus (verolimus), pull-fluoro limus, laquinimod, mycophenolic acid, and such imidazoquinoline amine imiquimod, its salts, derivatives thereof, and mixtures thereof. 合适的维生素D类似物包括，但不限于，骨化二醇，骨化三醇，卡泊三烯，帕立骨化醇，22-氧杂骨化三醇，双氢速留醇，维生素D2，其盐，其衍生物，及其混合物。  Suitable vitamin D analogs include, but are not limited to, calcifediol, calcitriol, calcipotriene, paricalcitol, 22-oxa-calcitriol, dihydrotachysterol left alcohol , vitamin D2, salts thereof, derivatives thereof, and mixtures thereof. 合适的皮质类固醇包括，但不限于，二丙酸阿氯米松，安西奈德，二丙酸倍氯米松，苯甲酸倍他米松，二丙酸倍他米松，戊酸倍他米松，布地奈德，丙酸氯倍他索，丁酸氯倍他松，醋酸可的松，地奈德，去羟米松，二醋酸二氟拉松，戊酸二氟可龙，氟氯奈德，新戊酸氟地塞米松，氟西奈德，醋酸氟轻松，氟考丁酯，氟可龙，醋酸氟泼尼定，氟氢缩松，氟羟可舒松，丙酸氟替卡松，哈西奈德，丙酸卤倍他索，氢化可的松，醋酸氢化可的松，丁酸氢化可的松，丙酸氢化可的松，戊酸氢化可的松，醋酸甲基泼尼松龙，糠酸莫米松，盐酸丙吗卡因，醋酸泼尼松，戊酸泼尼松，曲安奈德，泼尼卡酯，其盐，其衍生物，及其混合物。  Suitable corticosteroids include, but are not limited to, alclometasone dipropionate, amcinonide, beclomethasone dipropionate, betamethasone benzoate, betamethasone dipropionate, betamethasone valerate, budesonide, clobetasol propionate, clobetasone butyrate, cortisone acetate, desonide, desoximetasone, diflorasone diacetate, diflucortolone fluocortolone, fluclorolone acetonide, flumethasone pivalate, fluocinolone acetonide, fluocinonide, fluocortin butyl, fluocortolone, fluprednidene acetate, fluprednisolone, flurandrenolide, flurandrenolide, fluticasone propionate, halcinonide, halobetasol propionate, hydrocortisone, hydrocortisone acetate, hydrocortisone butyrate, hydrocortisone propionate, hydrocortisone valerate, methylprednisolone acetate, prednisolone furoate Mo betamethasone, pramoxine hydrochloride, prednisone acetate, prednisone valerate, triamcinolone acetonide, prednicarbate, salts thereof, derivatives thereof, and mixtures thereof. 合适的抗组胺剂包括，但不限于，西替利嗪，伐匹他定，苯海拉明，曲普利啶，美吡拉敏，氯环力嗪，异丙嗪，卡比沙明，曲吡那敏，溴苯那敏，羟嗪，特非那定，氯苯那敏，其盐，其衍生物，及其混合物。  Suitable antihistamines include, but are not limited to, cetirizine, cutting horses he will, diphenhydramine, triprolidine, pyrilamine, chloro Huanli, promethazine, card Bi Shaming, tripelennamine, brompheniramine, hydroxyzine, terfenadine, chlorpheniramine, salts thereof, derivatives thereof, and mixtures thereof. 合适的抗细菌剂包括，但不限于，庆大霉素，新霉素，链霉素，头孢泊肟酯，克林霉素，林可霉素，红霉素，杆菌肽，短杆菌肽，万古霉素，多西环素，米诺环素，土霉素，四环素，磷霉素，夫西地酸，莫匹罗星，磺胺醋酰，甲硝唑和氨苯砜，其盐，其衍生物，及其混合物。  Suitable antibacterial agents include, but are not limited to, gentamicin, neomycin, streptomycin, cefpodoxime proxetil, clindamycin, lincomycin, erythromycin, bacitracin, short bacitracin, vancomycin, doxycycline, minocycline, oxytetracycline, tetracycline, fosfomycin, fusidic acid, mupirocin, sulfacetamide, dapsone and metronidazole, which salts thereof, derivatives thereof, and mixtures thereof. i 碳烯酸，丙酸锌，灰黄霉素，寡霉素，批咯尼群，西卡宁，绿毛霉素(viridian),其盐,其衍生物，及其混合物。 i undecylenic acid, zinc propionate, griseofulvin, oligomycin, batch slightly nitrendipine, Xi Kaning, Lvmao neomycin (Viridian), salts thereof, derivatives thereof, and mixtures thereof. 合适的抗病毒剂包括，但不限于，阿昔洛韦，地昔洛韦，卡波佛，泛昔洛韦，膦甲酸钠，更昔洛韦，干扰素，喷昔洛韦，伐昔洛韦，其盐，其衍生物，及其混合物。  Suitable antiviral agents include, but are not limited to, acyclovir, valacyclovir to, Kaposi Buddha, famciclovir, foscarnet, ganciclovir, interferon, penciclovir, valacyclovir , salts thereof, derivatives thereof, and mixtures thereof. 合适的细胞毒素剂包括，但不限于，硫唑嘌呤，环磷酰胺，环孢菌素，甲氨蝶呤，羟基脲，沙利度胺，博来霉素，氟尿嘧啶，其盐，其衍生物，及其混合物。  Suitable cytotoxic agents include, but are not limited to, azathioprine, cyclophosphamide, cyclosporine, methotrexate, hydroxyurea, thalidomide, bleomycin, fluorouracil, a salt thereof, derivatives thereof, and mixtures thereof. 示例性补骨脂素为甲氧沙林。  Exemplary psoralen is methoxsalen. 合适的抗雄激素包括，但不限于，螺内酯，环丙孕酮，氟他胺，非那雄胺，其盐，其衍生物，及其混合物。  Suitable anti-androgens include, but are not limited to, spironolactone, cyproterone, flutamide, finasteride, salts thereof, derivatives thereof, and mixtures thereof. 示例性抗脱发剂为米诺地尔。  Exemplary anti-alopecia agent is minoxidil. 合适的止痒剂包括，但不限于，炉甘石，樟脑和薄荷醇，其盐，其衍生物，及其混合物。  Suitable antipruritic agents include, but are not limited to calamine, camphor and menthol, salts thereof, derivatives thereof, and mixtures thereof. 合适的角质层分离剂包括，但不限于，过氧化苯甲酰，水杨酸，脲，间苯二酚，硫，其盐，其衍生物，及其混合物。  Suitable keratolytic agents include, but are not limited to, benzoyl peroxide, salicylic acid, urea, resorcinol, sulfur, salts thereof, derivatives thereof, and mixtures thereof. 合适的焦油包括，但不限于，煤焦油，松焦油，木焦油，其盐，其衍生物，及其混合物。  Suitable tar include, but are not limited to, coal tar, pine tar, wood tar, their salts, derivatives thereof, and mixtures thereof. 合适的防腐剂包括，但不限于，过氧化氢，氯己定，西曲溴铵，聚乙烯吡咯酮碘，三氯生，其盐，其衍生物，及其混合物。  Suitable preservatives include, but are not limited to, hydrogen peroxide, chlorhexidine, cetrimide, povidone iodine, triclosan, salts thereof, derivatives thereof, and mixtures thereof. 合适的遮光剂包括，但不限于，氨基苯甲酸，阿伏苯宗，贝曲嗪诺，比索曲唑，β -胡萝卜素，西诺沙酯，4_( 二甲基氨基)苯甲酸，二羟苯宗，甲酚曲唑，依莰舒，恩索利唑，乙基己基三嗪酮，胡莫柳酯，指甲花醌，邻氨基苯甲酸薄荷基酯，4-甲基亚苄基樟脑，美克西酮，奥他苯酮，奥克立林，甲氧肉桂酸辛酯，水杨酸辛酯，羟甲氧苯酮，舒利苯酮，氧化锌，二氧化钛，其盐，其衍生物，及其混合物。  Suitable opacifying agents include, but are not limited to, aminobenzoic acid, avobenzone, Connaught shell trimetazidine, peso letrozole, β - carotene, cinoxate, 4_ (dimethylamino) benzoic acid , dioxybenzone, drometrizole, ecamsule, Ensuo Li oxazole, ethylhexyl triazone, homosalate, lawsone, menthyl anthranilate, 4-methylbenzylidene camphor group, United States Alexis ketone, benzophenone he Austrian, octocrylene, octyl methoxycinnamate, octyl salicylate, oxybenzone, sulisobenzone, zinc oxide, titanium dioxide, salts thereof, derivatives thereof , and mixtures thereof. 合适的麻醉剂和镇痛剂包括，但不限于，苯佐卡因，利多卡因，丙胺卡因和水杨酸胆碱，其盐，其衍生物，及其混合物。  Suitable analgesics and anesthetics include, but are not limited to, benzocaine, lidocaine, prilocaine, and choline salicylate, salts thereof, derivatives thereof, and mixtures thereof. 合适的皮肤调节剂包括，但不限于，烃油和蜡，聚硅氧烷，脂肪酸衍生物，胆固醇，甘油二酸酯和甘油三酸酯，植物油，乙酰甘油酯，烷基酯，链烯基酯，羊毛脂，牛乳甘油三酯，蜡酯，蜂蜡，固醇，磷脂，其衍生物，及其混合物。  Suitable skin conditioning agents include, but are not limited to, hydrocarbon oils and waxes, silicones, fatty acid derivatives, cholesterol, diglycerides and triglycerides, vegetable oils, acetylated glycerides, alkyl esters, alkenyl esters, lanolin, milk triglycerides, wax esters, beeswax, sterols, phospholipids, derivatives thereof, and mixtures thereof. 示例性营养剂包括维生素，必需氨基酸，必需脂肪，抗氧化剂，其盐，其衍生物，及其混合物。  Exemplary nutritional agents include vitamins, essential amino acids, essential fats, antioxidants, salts, derivatives thereof, and mixtures thereof. 本发明的局部泡沫组合物还包含水。  topical foam composition of the present invention further comprises water. 水形成乳液系统的连续相。 Water continuous phase of the emulsion system is formed. 在一个实施方案中，该泡沫组合物包含水的量为约65%至约90重量％。 In one embodiment, the foam composition comprises an amount of water is about 65% to about 90 wt%. 在另一实施方案中，水的存在量为约70%至约85重量％。 In another embodiment, the water is present in an amount of from about 70% to about 85 wt%. 在另一实施方案中，水的存在量为约77重量％。 In another embodiment, the water is present in an amount of from about 77 wt%. [0101 ] 本发明的局部泡沫组合物包含油可混溶的有机溶剂以促进活性剂在油中的溶解。  topical foam composition of the present invention comprises an oil-miscible organic solvent to facilitate dissolution of the active agent in the oil. 该油可混溶的有机溶剂和油一起构成组合物的油相。 The oil-miscible organic solvent constituting the oil phase together with the oil and composition. 该油可混溶的有机溶剂在组合物中存在的量为约I %至约20重量％。  The oil-miscible organic solvent is present in the composition in an amount of from about I% to about 20 wt%. 在一个实施方案中，该油可混溶的有机溶剂的存在量为约3%至约15重量％。 In one embodiment, the oil-miscible organic solvent is present in an amount of from about 3% to about 15 wt%. 在另一实施方案中，该油可混溶的有机溶剂的存在量为约5重量％。 In another embodiment, the oil-miscible organic solvent is present in an amount of from about 5 wt%. 合适地，油可混溶的有机溶剂的非限制性实例包括醇如辛醇，癸醇，十二烷基十六醇，十二烷基十四醇，己醇，己基癸醇，己基癸基十八醇，异鲸蜡醇，异硬脂醇，月桂醇，肉豆蘧醇，辛基癸醇，辛基十二烷醇，油醇，十三醇；酯，如硬脂酸丁基酯，苯甲酸C12-15烷基酯，乳酸C12-15烷基酯，甘油三辛酸/癸酸酯，乙基己酸鲸蜡硬脂基酯，异壬酸鲸蜡硬脂基酯，辛酸鲸蜡基酯，棕榈酸鲸蜡基酯，椰油-辛酸酯/癸酸酯，椰油甘油酯，油酸癸基酯，己二酸二丁基酯，碳酸二辛基酯，己二酸二乙基己基酯，琥珀酸二乙基己基酯，己二酸二异丙基酯，苹果酸二辛基酯，二-PPG-2肉豆蘧醇聚氧乙烯醚-10己二酸酯，二-PPG-3肉豆蘧基醚己二酸酯，油酸乙酯，椰油酸乙基己基酯，羟基硬脂酸乙基己基酯，棕榈酸乙基己基酯，壬酸乙基己基酯，硬脂酸乙基己基酯，月桂酸  Suitably, non-limiting examples of oil-miscible organic solvents include alcohols such as octanol, decanol, lauryl cetyl alcohol, dodecyl tetradecyl alcohol, hexyl alcohol, hexyl decanol, hexyldecyl octadecanol, isocetyl alcohol, isostearyl alcohol, lauryl alcohol, myristoyl alcohol Qu, octyl decanol, octyl dodecanol, oleyl alcohol, tridecyl alcohol; esters, such as stearic acid butyl benzoate, C12-15 alkyl lactate, C12-15 alkyl acrylate, glycerol tri caprylate / caprate, cetearyl ethylhexanoate ester, isononanoic acid, cetyl stearyl, cetyl octanoate, cetyl palmitate, coco - caprylate / caprate, glyceryl cocoate, decyl oleate, dibutyl adipate, dioctyl carbonate, hexyl di-ethylhexyl adipate, di-ethylhexyl adipate, diisopropyl carbonate, octyldodecyl myristate, di-myristoyl -PPG-2 Qu alcohol polyoxyethylene ether adipate -10 di -PPG-3 myristoyl Qu ether adipate, ethyl oleate, ethylhexyl cocoate, ethylhexyl hydroxystearate, ethylhexyl palmitate, pelargonic acid ethyl hexyl, ethylhexyl stearate, laurate 己基酯，月桂酸己基癸基酯，硬脂酸己基癸基酯，硬脂酸异鲸蜡基酯，硬脂酸异鲸蜡基硬脂基酯，油酸异癸基酯，肉豆蘧酸异丙酯，棕榈酸异丙基酯，新戊酸异硬脂基酯，异壬酸异十三烷基酯，乳酸月桂基酯，乳酸肉豆蘧基酯，肉豆蘧酸肉豆蘧基酯，硬脂酰硬脂酸辛基十二烷基酯，芥酸油烯基酯，油酸油烯基酯，季戊四醇四辛酸酯/四癸酸酯，季戊四醇四异硬脂酸酯，PPG-2肉豆蘧基醚丙酸酯，丙二醇二辛酸酯/ 二癸酸酯，丙二醇异硬脂酸酯，辛酸丙基庚基酯，辛酸硬脂基酯；醚如二辛基醚，PPG-10鲸蜡基醚，PPG-1l硬脂基醚，PPG-14 丁基醚，PPG-15硬脂基醚，PPG-3氢化蓖麻油，PPG-3肉豆蘧基醚；羧酸如C10-40羟基烷基酸，C10-40异烷基酸，C32-36异烷基酸，癸酸，己酸，辛酸，椰子酸，月桂酸，亚油酸，亚麻酸，亚麻子酸，肉豆蘧酸，油酸，蓖麻油酸和羊毛脂。 Hexyl acrylate, hexyl laurate, decyl stearate, hexyldecyl stearate, isocetyl stearate, isocetyl stearyl, isodecyl oleate, myristoyl Qu acid isopropyl palmitate, isopropyl acrylate, isostearyl neopentanoate, isononyl tridecyl, lauryl lactate, myristoyl Qu acid ester, myristoyl group Qu Qu acid nutmeg ester, stearyl stearate, octyldodecyl, erucic acid oleyl ester, oleic acid oleyl ester, pentaerythritol caprylate / caprate four, pentaerythritol tetraisostearate, PPG- 2 myristoyl Qu ether propionate, propylene glycol dicaprylate / dicaprate, propylene glycol isostearate, caprylic propyl heptyl acrylate, stearyl octanoate; ethers such as dioctyl ether, PPG- 10 cetyl ether, PPG-1l stearyl ether, PPG-14 butyl ether, PPG-15 stearyl ether, PPG-3 hydrogenated castor oil, PPG-3 myristoyl Qu ether; carboxylic acids such as C10- 40 hydroxyalkyl acid, C10-40 isoalkyl acid, C32-36 isoalkyl acid, capric acid, caproic acid, caprylic acid, coconut acid, lauric acid, linoleic acid, linolenic acid, linseed acid, myristoyl Qu acid, oleic acid, castor oil and lanolin. 根据一个实施方案，该油可混溶的有机溶剂选自己二酸二异丙基酯，肉豆蘧酸异丙酯，十二烷醇和辛酸/癸酸甘油三酯。  According to one embodiment, the oil-miscible organic solvent is selected from isopropyl esters of adipic, myristoyl Qu isopropyl myristate, lauryl alcohol, and caprylic / capric triglyceride. 根据另一实施方案，本发明的组合物包含第二药物可接受的活性剂。  According to another embodiment, the present composition comprises a second pharmaceutically acceptable active agent. 在一个实施方案中，该第二活性剂溶解于水相(即连续相)。 In one embodiment, the second active agent is dissolved in the aqueous phase (i.e., continuous phase). 这可通过以下实现:将该第二活性剂溶于等分部分的水或等分部分的水可混溶的有机溶剂，随后将该等分部分溶于组合物中。 This can be achieved through: the second active agent is dissolved in water or a water-miscible organic solvent aliquot aliquot, then the aliquot of the composition was dissolved. 根据一个实施方案，该水可混溶的有机溶剂的存在量为约1%至约20重量％。  According to one embodiment, the water-miscible organic solvent is present in an amount of from about 1% to about 20 wt%. 根据另一实施方案，该水可混溶的有机溶剂的存在量为约10重量％。 According to another embodiment, the water-miscible organic solvent is present in an amount of from about 10 wt%. 适当地，水可混溶的有机溶剂包括，但不限于，醇，包括戊醇，苄醇，环己烷二甲醇，二丙酮醇，乙醇，己醇，异丁醇，异丙醇，甲醇，正丁醇，丙醇，叔丁基醇，四氢糠醇；羧酸，包括乙酸；二醇，包括1，2_己二醇，丁二醇，二甘醇，二丙二醇，乙基己二醇，乙二醇，己二醇，戊二醇，丙二醇，四甘醇，三甘醇，三聚丙二醇；和多元醇，包括聚乙二醇，丁烷三醇，甘油和1，2,6-己三醇。  Suitably, the water miscible organic solvents include, but are not limited to, alcohols, including pentanol, benzyl alcohol, cyclohexane dimethanol, diacetone alcohol, ethyl alcohol, hexyl alcohol, isobutyl alcohol, isopropyl alcohol , methanol, butanol, propanol, tert-butyl alcohol, tetrahydrofurfuryl alcohol; carboxylic acids, including acetic acid; diols, including 1,2_ hexylene glycol, butylene glycol, diethylene glycol, dipropylene glycol, ethyl hexylene glycol, ethylene glycol, hexylene glycol, neopentyl glycol, propylene glycol, tetraethylene glycol, triethylene glycol, tripropylene glycol; and polyhydric alcohols including polyethylene glycol, butane-triol, glycerol, and 1,2 1,6-triol. 在一个实施方案中，该水可混溶的有机溶剂为丙二醇。  In one embodiment, the water-miscible organic solvent is propylene glycol. 认识到本发明的局部泡沫组合物必须使用推进剂以在使用时产生泡沫。  appreciated that topical foam composition of the present invention must use a propellant to generate foam in use. 推进剂可为任何合适的液化气体或其混合物，如烃，氯氟碳化合物，二甲基醚，氢氟碳化合物及其混合物。 Propellant may be any suitable liquefied gas or mixtures, such as hydrocarbons, chlorofluorocarbons, dimethyl ether, hydrofluorocarbons and a mixture thereof. 其它合适的推进剂包括压缩气体如氮，二氧化碳，一氧化二氮和空气。  Other suitable propellants include compressed gas such as nitrogen, carbon dioxide, nitrous oxide and air. 在一个实施方案中，该推进剂为烃的混合物。 In one embodiment, the propellant is a mixture of hydrocarbons. 在另一优选实施方案中，烃的混合物为丙烷、正丁烷和异丁烷的混合物。 In another preferred embodiment, a mixture of hydrocarbons are propane, n-butane and isobutane mixture. 推进剂的存在量为约I %至约20重量％，或约3%至约15重量％。  The propellant is present in an amount from about I% to about 20 wt%, or about 3% to about 15 wt%. 在一个实施方案中，推进剂的存在量为约5%至约10重量％，如约5%，6%，7%，8%，9%或10重量％。 In one embodiment, the propellant is present in an amount of from about 5% to about 10 wt%, such as about 5%, 6%, 7%, 8%, 9% or 10% by weight. 该推进剂可在填充时加入组合物中，使用压力容器如标准气雾剂分配器。 The propellant may be added to the composition, a pressure vessel such as a standard aerosol dispenser during filling. 当该组合物从压力容器释放时，该组合物为泡沫气雾剂(也已知为摩丝)。  When the composition is released from the pressure vessel, the composition is an aerosol foam (also known as mousse). 根据一个实施方案，该泡沫气雾剂为均匀的。 According to one embodiment, the aerosol foam is uniform. 在另一实施方案中，该泡沫气雾剂用剪切力，如轻微机械作用例如涂搽或喷散可轻易破碎。 In another embodiment, the aerosol foam with shearing forces, such as, for example, slight mechanical action or application may be easily broken diffuser. 在另一实施方案中，该推进剂不存在于组合物中。  In another embodiment, the propellant is not present in the composition. 根据该实施方案，该组合物可通过机械手段，如通过在容器上的泵作用或挤压作用从其容器中挤出。 According to this embodiment, the composition may be by mechanical means, such as by a pump to the container or squeeze action effect extrusion from its container. 本文使用的合适的压力容器包括铝、锡板和玻璃容器。  Suitable pressure vessel used herein include aluminum, tin plate and glass containers. 在一个实施方案中，该压力容器为整体的铝容器，其中内表面衬有化学惰性的衬里。  In one embodiment, the pressure vessel as an integral aluminum container, wherein the inner surface is lined with a chemically inert lining. 本文使用的一个合适的内表面衬里为聚酰胺-酰亚胺(PAM)JnExal Corporation, ofYoungstown, Ohio提供的。 A suitable inner surface of the liner used herein, a polyamide - imide (PAM) JnExal Corporation, ofYoungstown, Ohio provided. 该容器可安装直立使用或颠倒使用的阀和常规泡沫喷射致动器。 The container may be installed using the upright or inverted valves used in conventional bubble jet actuator. 或者，该容器可安装定量的阀。 Alternatively, the container may be quantified installed valve. 根据一个实施方案，该组合物可进一步包含一种或多种皮肤病学可接受的赋形齐U。  According to one embodiment, the composition may further comprise one or more dermatologically acceptable excipient together U. 该皮肤病学可接受的赋形剂的非限制性实例包括稀释剂，悬浮剂，佐剂，防腐剂，着色齐ϋ，润滑剂，pH调节剂(包括缓冲剂)，增稠剂，润湿剂，芳香剂，稳定剂，螯合剂，抗结块剂，粘度增加剂，增溶剂，增塑剂，渗透促进剂，成膜剂，抗氧化剂，湿润剂，泡沫促进剂或任何这些成分的混合物。 The dermatologically-acceptable, non-limiting examples of excipients include diluents, suspending agents, adjuvants, preservatives, coloring Qi ϋ, lubricants, pH adjusting agents (including buffers), thickening agents, wetting agents, flavoring agents, stabilizers, chelating agents, anticaking agents, viscosity increasing agents, solubilizers, plasticizers, penetration enhancers, film formers mixture, antioxidants, wetting agents, foam boosters or any of these components . 在一个实施方案中，该一种或多种皮肤病学可接受的赋形剂包括防腐剂、抗氧化剂和pH调节剂。  In one embodiment, the one or more dermatologically acceptable excipients include preservatives, antioxidants and pH adjusting agents. 本发明的局部泡沫气雾剂组合物可另外包含防腐剂。  topical aerosol foam composition of the present invention may further comprise a preservative. 防腐剂在组合物中存在的量为约0.01%至约2重量％。 Preservative present in the composition in an amount from about 0.01% to about 2% by weight. 在一个实施方案中，防腐剂的存在量为约0.1 %至约I重量％。 In one embodiment, the preservative is present in an amount of from about 0.1% to about I wt.%. 在另一实施方案中，防腐剂的存在量为约0.3重量％。 In another embodiment, the preservative is present in an amount of from about 0.3 wt%. 合适的防腐剂包括，但不限于苄醇，重氮烷基脲，对羟苯甲酸甲酯，对羟基苯甲酸乙酯，对羟苯甲酸丙酯，对羟苯甲酸丁酯，苯氧基乙醇，山梨酸和其盐如山梨酸钾，苯甲酸和其盐如苯甲酸钠，及其混合物。  Suitable preservatives include, but are not limited to benzyl alcohol, diazolidinyl urea, methyl paraben, ethyl paraben, propyl paraben, butyl paraben, benzyl phenoxyethanol, sorbic acid and its salts such as potassium sorbate, benzoic acid and salts thereof such as sodium benzoate, and mixtures thereof. 根据一个实施方案，该防腐剂为山梨酸和山梨酸钾的混合物。  According to one embodiment, the preservative is a mixture of sorbic acid and potassium sorbate. 本发明的局部泡沫气雾剂组合物可进一步包含抗氧化剂。  topical aerosol foam compositions of the invention may further comprise an antioxidant. 该抗氧化剂在组合物中存在的量为约0.001 %至约I重量％。 The antioxidant is present in the composition in an amount of from about 0.001% to about I wt.%. 在一个实施方案中，该抗氧化剂的存在量为约0.05%至约0.5重量％。 In one embodiment, the antioxidant is present in an amount of from about 0.05% to about 0.5 wt%. 在另一实施方案中，该抗氧化剂的存在量为约0.1重量％。 In another embodiment, the antioxidant is present in an amount of from about 0.1 wt%. 合适的抗氧化剂包括，但不限于，丁化羟基甲苯(BHT)，丁化羟基苯甲醚，生育酚，没食子酸丙基酯，维生素E TPGS，其衍生物，及其混合物。  Suitable antioxidants include, but are not limited to, butylated hydroxytoluene (BHT), butylated hydroxyanisole, tocopherols, gallic acid propyl ester, Vitamin E TPGS, derivatives thereof, and mixtures thereof. 在一个实施方案中，该抗氧化剂为BHT。 In one embodiment, the antioxidant is BHT. 本发明的局部泡沫气雾剂组合物可进一步包含pH调节剂以帮助稳定该活性剂。  topical aerosol foam compositions of the invention may further comprise a pH adjusting agent to help stabilize the active agent. 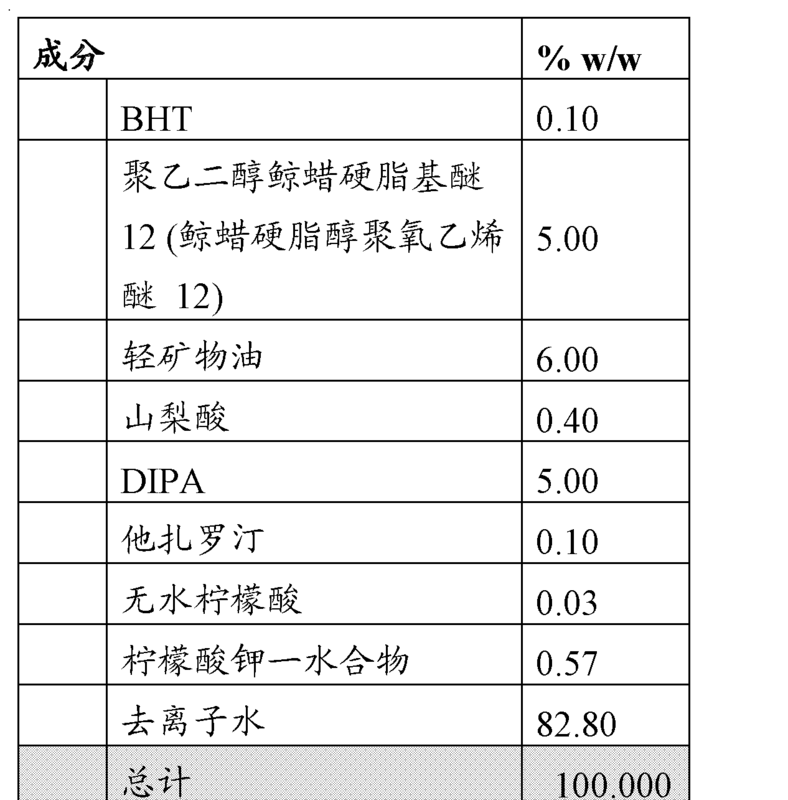 根据一个实施方案，PH调节剂的存在量为约0.01%至约10重量％。 According to one embodiment, PH adjusting agent is present in an amount of from about 0.01% to about 10 wt%. 在一个实施方案中，pH调节剂为碱。 In one embodiment, pH adjusting agent is a base. 合适的PH调节碱包括但不限于碳酸氢盐，碳酸盐和氢氧化物(如碱金属或碱土金属氢氧化物，以及过渡金属氢氧化物)。 Suitable bases include, but are not limited PH adjusted to bicarbonates, carbonates and hydroxides (such as alkali metal or alkaline earth metal hydroxides, and transition metal hydroxides). PH调节剂也可为酸，酸式盐，或其混合物。 PH adjusting agent may also be an acid, acid salt, or mixtures thereof. pH调节剂也可为缓冲剂。 pH adjusting agents may also be buffering agents. 合适的缓冲剂包括，但不限于柠檬酸盐/柠檬酸，乙酸盐/乙酸，磷酸盐/磷酸，甲酸盐/甲酸，丙酸盐/丙酸，乳酸盐/乳酸，碳酸盐/碳酸，铵/氨，依地酸盐/依地酸，其衍生物，及混合物。 Suitable buffering agents include, but are not limited to, citrate / citric acid, acetate / acetic acid, phosphate / phosphoric acid, formate / formic acid, malonic acid / propionic acid, lactate / lactic acid, carbonate / carbonate, ammonium / ammonia, edetate / edetic acid, derivatives thereof, and mixtures thereof. 根据一个实施方案，该pH调节剂为柠檬酸盐/柠檬酸缓冲齐U。 According to one embodiment, the pH adjusting agent is a citrate / citric acid buffer flush U. 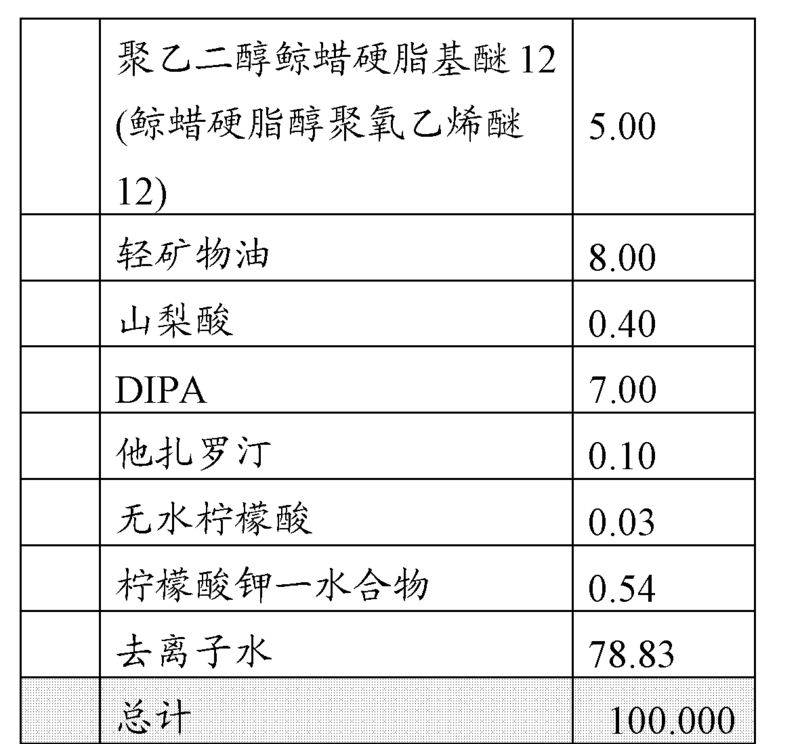 根据一个实施方案，该柠檬酸盐/柠檬酸缓冲剂的存在量为约0.02%至约2重量％。 According to one embodiment, the citrate / citric acid buffer is present in an amount of from about 0.02% to about 2% by weight. 在另一实施方案中，本发明涉及水包油型乳液泡沫气雾剂组合物，其包含:他扎罗汀,水,约3%至约8重量％的油，油可混溶的有机溶剂，约2%至约6重量％的包含非离子亲水性表面活性剂的表面活性剂成分，和烃推进剂，其中他扎罗汀溶解于组合物的油相且其中油相的颗粒尺寸小于约lOOOnm。  In another embodiment, the present invention relates to oil-in-water emulsion aerosol foam composition, comprising: tazarotene, water, from about 3% to about 8% by weight of oil, oil miscible organic solvent, from about 2% to about 6% by weight of the surfactant component comprises a non-ionic hydrophilic surfactant and a hydrocarbon propellant, wherein the tazarotene is dissolved in the composition of an oil phase wherein the oil phase and particle size less than about lOOOnm. 根据一个实施方案，他扎罗汀泡沫气雾剂的油相的平均颗粒尺寸为约lOOnm。  According to one embodiment, the average particle size of an aerosol foam tazarotene oil phase is from about lOOnm. 这些实施方案示例的他扎罗汀泡沫制剂特别适合于施用于脸部小区域以治疗痤疮。  These exemplary embodiments tazarotene foam formulations are particularly suitable for administration to small areas of the face to treat acne. 在一个实施方案中，该他扎罗汀泡沫气雾剂制剂从计量剂量的致动器分配。 In one embodiment, the formulation of tazarotene foam dispensed from an aerosol actuator metered dose. 在另一实施方案中，该他扎罗汀泡沫气雾剂组合物配制成大粒乳液(即油相的颗粒尺寸大于IOOOnm)。 In another embodiment, the tazarotene aerosol foam composition is formulated to be larger grain emulsion (i.e. an oil phase particle size of greater than IOOOnm). 在另一实施方案中，第二药物活性剂溶解于该组合物。  In another embodiment, the second pharmaceutically active agent is dissolved in the composition. 在另一实施方案中，第二药物活性剂溶解于组合物的水相。 In another embodiment, the second pharmaceutically active agent is dissolved in the aqueous phase of the composition. 这可通过以下实现:将该另一药物活性剂溶于等分部分的水，然后将其溶解于组合物中。 This can be achieved through: the other pharmaceutically active agent is dissolved in an aliquot of water, then dissolved in the composition. 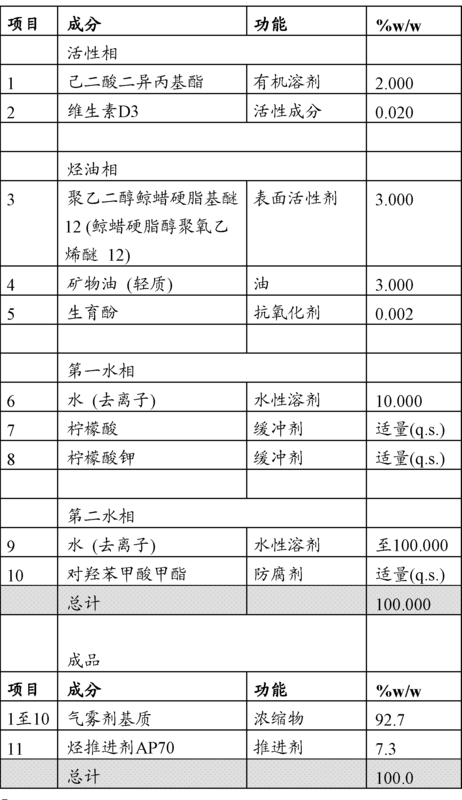 如本文所使用的，术语"给药(administering)"和“给药(administered) ”是指以所述方式向受治疗者递送组合物以提供治疗效果的任何方法。  As used herein, the term "administering (Administering)" and "administering (Administered)" refers to the composition of the delivery to the subject by any means to provide a therapeutic effect. 如本文所使用的，术语“其衍生物”是指药物活性剂的前药，溶剂化物，水合物，酯和酸。  As used herein, the term "derivative thereof" refers to those prodrugs of the pharmaceutically active agent, solvates, hydrates, esters and acids. 如本文所使用的，术语“有效量"的活性剂或成分，或药物活性剂或成分(其在此处为同义的)，是指给药后足以具有治疗效果的药物活性剂的量。 Pharmaceutically active agent  As used herein, the term "effective amount" of an active agent or ingredient, or pharmaceutically active agent or ingredient (which is synonymous here) sufficient to have a therapeutic effect after administration, it refers to amount. 有效量的活性剂可能，将会或预期能缓解症状。 Effective amount of active agent may be, will be, or expected to alleviate the symptoms. 有效量的活性剂将根据治疗的具体疾病或疾病、疾病严重性、治疗持续时间、和使用的组合物的具体成分而改变。 An effective amount of an active agent according to the severity of the particular disease or treatment of disease, the disease, the duration of treatment, and the particular composition used component changes. 如本文所使用的，术语“脂肪醇”是指具有约9至约22个碳原子长度的脂肪链的醇。  As used herein, the term "fatty alcohol" refers to alcohol having fatty chains from about 9 to about 22 carbon atoms in length. 如本文所使用的，“乳液”是指两种或更多种不混溶的(不可混合的)液体的混合物，其中分散相(即在水包油型乳液情况中的油)的颗粒尺寸小于约10，000nm。  As used herein, "emulsion" refers to two (non-mixed), or a mixture of more immiscible liquids wherein the dispersed phase (i.e., in the case of oil-water-oil-emulsion) of particle size less than about 10,000nm. 如本文所使用的，“亚微乳液”是指两种或更多种不混溶的(不可混合的)液体的混合物，其中分散相(即在水包油型乳液情况中的油)的颗粒尺寸范围为约IOOnm至约lOOOnm。  As used herein, "submicron emulsion" refers to two (non-mixed), or a mixture of more immiscible liquids wherein the dispersed phase (i.e., oil-in-water type emulsion in the case of ) particle size ranging from about IOOnm to about lOOOnm. 如本文所使用的，“微乳液”是指两种或更多种不混溶的(不可混合的)液体的混合物，其中分散相(即在水包油型乳液情况中的油)的颗粒尺寸范围为约IOnm至约lOOnm。  As used herein, "microemulsion" refers to a (non-mixed) mixtures of two or more immiscible liquids wherein the dispersed phase (i.e., oil-in-water type emulsion of the case) particle size range of from about IOnm to about lOOnm. 如本文所使用的，“纳米乳液”是指两种或更多种不混溶的(不可混合的)液体的混合物，其中分散相(即在水包油型乳液情况中的油)的颗粒尺寸范围为约Inm至lOOnm。  As used herein, "nanoemulsion" refers to a (non-mixed) mixtures of two or more immiscible liquids wherein the dispersed phase (i.e., oil-in-water type emulsion of the case) particle size range of from about Inm to lOOnm. 如本文所使用的，术语“相转变温度”是指水包油型乳液转变成油包水型乳液(或反过来)的温度。  As used herein, the term "phase transition temperature" refers to oil in water type emulsion into a water-in-oil temperature (or vice versa). 如本文所使用的，"pH调节剂"是指添加至组合物中的特定pH调节剂，包括但不限于，缓冲剂、碱或酸，其盐及其混合物。  As used herein, "pH adjusting agent" refers to a particular pH adjusting agent added to the composition, including but not limited to, buffers, bases or acids, salts thereof, and mixtures thereof. 本文使用的术语"皮肤病学可接受的赋形剂"是指本文所述组合物中存在的任何非活性成分。  As used herein, the term "dermatologically acceptable vehicle" refers to any non-active ingredient of the present composition described herein. 如本文所使用的，术语“药物可接受的盐”是指药物可接受且具有母体化合物所需的药理活性的盐。  As used herein, the term "pharmaceutically acceptable salts" refers to pharmaceutically acceptable salt thereof and having the desired pharmacological activity of the parent compound. 所述盐包括:(I)与酸形成的酸加成盐，所述酸例如，乙酸，苯甲酸，柠檬酸，葡糖酸，谷氨酸，戊二酸，乙醇酸，盐酸，乳酸，马来酸，苹果酸，丙二酸，扁桃酸，磷酸，丙酸，山梨酸，琥珀酸，硫酸，酒石酸，天然和合成衍生的氨基酸，及其混合物；或(2)通过以下形成的盐:当母体化合物中存在的酸性质子时，(i)被金属离子例如碱金属离子，碱土金属离子，或铝离子代替；或(ii)使有机碱，例如，乙醇胺，二乙醇胺，三乙醇胺，缓血酸胺和N-甲基葡糖胺质子化。 Such salts include: acid addition salts of (I) formed with acids, said acids e.g., acetic, benzoic, citric, gluconic acid, glutamic acid, glutaric acid, glycolic acid, hydrochloric acid, lactic acid, MA acid, malic acid, malonic acid, mandelic acid, phosphoric acid, propionic acid, sorbic acid, succinic acid, sulfuric acid, tartaric acid, naturally and synthetically derived, and mixtures thereof; or (2) by forming a salt of the following: when an acidic proton parent compound present, (I) are, for example, an alkali metal ion, an alkaline earth metal ion, or an aluminum ion metal ion; or (ii) the organic bases, e.g., ethanolamine, diethanolamine, triethanolamine, tromethamine, and N- methylglucamine protonated. 如本文所使用的，"受治疗者"、"个体"或"患者"是指任何受治疗者，特别是需要治疗的人。  As used herein, "subject", "individual" or "patient" is meant any subject, particularly a human in need of treatment. 如本文所使用的，“治疗(treatment) ”或“治疗(treating) ”疾病、障碍或病症包括减轻其至少一种症状，减少其严重性，或延迟、预防或抑制其进展。  As used herein, "treatment (treatment)" or "treatment (treating,)," a disease, disorder or condition comprises at least one symptom lessening, reducing the severity of, or delay, prevent or inhibit its progression. 治疗不需要意味着疾病、障碍或病症被完全治愈。 Treatment does not need to mean a disease, disorder or condition is completely cured. 本文所述的有用的组合物仅需要减少疾病、障碍或病症的严重性，减少与其相关的症状严重性，改善患者的生活质量，或延迟、预防或抑制疾病、障碍或病症的发生。 Useful herein composition requires only reduce the severity of a disease, disorder or condition, reduce the severity of symptoms associated therewith, to improve the quality of life, or delay, prevent or inhibit the occurrence of a disease, disorder or condition. 本文所述的任何浓度范围，百分比范围或比例范围应理解为包括在其范围和部分内的任何整体的浓度、百分比或比例，如整体的十分之一和百分之一，除非另有所述。 Any concentration ranges set forth herein, percentage range or scale range  should be understood to include any whole concentrations, percentages or proportions, and in the inner portion of its range, such as one tenth and one hundredth of the overall, unless another said. 应理解上文和本文其它地方使用的术语"一个"和"一种"是指"一个(种)或多个(种)"列举的成分。  understood that the term used above and elsewhere herein, "a" and "an" mean "one (species) or more (species)" enumerated components. 本领域技术人员清楚地是，使用的单数包括复数，除非另有说明。 It is clear to a person skilled in the art that the use of the singular includes the plural, unless otherwise indicated. 因此，术语"一个"、"一种"和“至少一个(种)”在本申请中可互换使用。 Accordingly, the terms "a", "an" and "at least one (kind of)" are used interchangeably in this application. 在整个申请中，各个实施方案的描述使用术语“包括”，然而，在一些具体情况下，一个实施方案可替代地用术语“基本上由......组成”或“由......组成”描述。  Throughout this application, various embodiments described in the term "comprising", however, in some specific cases, an embodiment may alternatively be used The term "consisting essentially ...... consisting of" or " ...... form a "description. 为了更好地理解本发明的教导且不以任何方式限制其范围，除非另有说明，所有表示量、百分比或比例的数值，以及说明书和权利要求书中使用的其它数值，应理解为在所有情况下通过术语“约”限制。  For a better understanding of the teachings of the present invention is not in any way limit the scope thereof, unless otherwise indicated, other numerical values ​​used in all numbers expressing quantities, percentages or proportions, as well as the specification and claims, it should be understood in all cases it is restricted by the term "about." 如本文所使用的，术语“基本上不含”特定成分是指组合物具有少于约I %的特定成分。  As used herein, the term "substantially free" of a particular component refers to a composition having a specific composition of less than about I%. 本文使用的其它术语应由其本领域公知的含义所定义。  Other terms used herein shall be defined in its art-recognized meaning. e)用推进剂推进亚微或微水包油型乳液的样品以形成水包油型亚微乳液或微乳液泡沫气雾剂(aerosol foam)。  e) promote the submicron or micro sample oil in water type emulsion with a propellant to form an oil-in-water submicron emulsion or microemulsion aerosol foam (aerosol foam). 根据一个实施方案，第一等分部分的水占亚微或微水包油型乳液泡沫气雾剂的总水含量的约10%至约40重量％且第二等分部分的水占亚微或微水包油型乳液泡沫气雾剂的总水含量的约90%至约60重量％。  According to one embodiment, a first aliquot portion of the water comprises about 10% of the total water content of submicron or micro-water type emulsions aerosol foam to about 40% by weight and a second aliquot of water It comprises from about 90% to about 60 wt% total water content or micro submicron oil-inwater emulsions in aerosol foam. 根据另一个实施方案，第一等分部分的水占亚微或微水包油型乳液泡沫气雾剂的总水含量的约15%至约35%且第二等分部分的水占亚微或微水包油型乳液泡沫气雾剂的总水含量的约85%至约65%。  According to another embodiment, a first aliquot of the water portion of the water accounts for about 15% of the total water content or micro submicron oil-inwater emulsions in aerosol foam to about 35% and a second aliquot of It comprises from about 85% to about 65% of the total water content of submicron or micro-oil-inwater emulsions in aerosol foam. 根据另一个实施方案，第一等分部分的水占亚微或微水包油型乳液泡沫气雾剂的总水含量的约20%至约30%且第二等分部分的水占亚微或微水包油型乳液泡沫气雾剂的总水含量的约80%至约70%。  According to another embodiment, a first aliquot of the water portion of the water accounts for about 20% of the total water content or micro submicron oil-inwater emulsions in aerosol foam to about 30% and the second aliquot It comprises from about 80% to about 70% of the total water content of submicron or micro-oil-inwater emulsions in aerosol foam. 根据另一实施方案，第一等分部分的水占亚微或微水包油型乳液泡沫气雾剂的总水含量的约25%且第二等分部分的水占亚微或微水包油型乳液泡沫气雾剂的总水含量的约75%。 According to another embodiment, a first aliquot portion of the water comprises about 25% of the total water content of submicron or micro-water type emulsions of foam aerosols and the second aliquot portion of the water accounts for submicron or micro-water about 75% of the total water content of the oil emulsion aerosol foam. 本文描述的方法提供低油和低表面活性剂亚微乳液或微乳液泡沫气雾剂的制备，其中制备浓亚微乳液或微乳液(包含第一等分部分的水)且随后稀释(用第二等分部分的水)至最终得到所需的低油和低表面活性剂亚微乳液或微乳液。  The methods described herein provide methods for preparing low oil and low surfactant submicron emulsion or microemulsion aerosol foam, wherein preparing espresso submicron emulsion or microemulsion (water comprising a first aliquot) and then diluted (with a second aliquot portion of the water) to give the desired final low fat and low surfactant submicron emulsion or microemulsion. 通过初始制备浓亚微乳液或微乳液，足够浓度的表面活性剂存在于组合物中以稳定亚微米或微米尺寸的油相。 Prepared by initially concentrated submicron emulsion or microemulsion, a sufficient concentration of surfactant present in the composition in order to stabilize the oil phase in submicron or micron size. 然后稀释步骤提供所需的低油和低表面活性剂亚微乳液或微乳液。 Then dilution step to provide the desired low oil and low surfactant submicron emulsion or microemulsion. 认为添加第二等分部分的水(其温度显著低于相转变温度)用来固定组合物的亚微乳液或微乳液结构，且当然，稀释该组合物以提供低油和低表面活性剂组合物。 That a second aliquot of water was added (the temperature of which is significantly lower than the phase transition temperature) to submicron emulsion or microemulsion compositions of the fixed structure, and of course, the composition was diluted to provide a combination of low oil and low surfactant thereof. 根据一个实施方案，第二药物活性剂溶解于组合物的水相。  According to one embodiment, the second pharmaceutically active agent is dissolved in the aqueous phase composition. 这可通过以下实现:将第二药物活性剂溶解于等分部分的水或水可混溶的有机溶剂，然后溶解(solubilize)于组合物中。 This can be achieved through: a second pharmaceutically active agent is dissolved in water or a water aliquot miscible organic solvent, and then dissolved (solubilize) in the composition. 在一个实施方案中，将溶于等分部分的水或水可混溶的有机溶剂的第二药物活性剂在步骤(d)后添加至亚微或微水包油型乳液中)。  In one embodiment, the water-soluble or water aliquot miscible organic solvent is added to a second pharmaceutically active agent or a submicron oil-in-water micro-emulsion after step (d)) . 即，在形成亚微乳液或微乳液后将第二药物活性剂溶解于组合物的水相中。 That is, in the phase after the submicron emulsion or microemulsion second pharmaceutically active agent is dissolved in water to form a composition. 本发明另一方面为该方法制备的产物。  another aspect of the present invention is a method for preparing the product. 本发明的乳液泡沫气雾剂组合物为化妆方面优异的且适用于涂覆至脸上以治疗皮肤疾病或病症。  emulsion aerosol foam composition of the present invention is excellent in terms of make-up applied to the face and suitable for the treatment of skin diseases or disorders. 该组合物容易涂布、不油腻、不干燥且在皮肤上残留最少的残余物。 The composition is easy to apply, non-greasy, non-drying on the skin and minimal residue remaining. 本发明提供治疗皮肤疾病、障碍或病症的方法，包括向需要该治疗的患者皮肤给药有效量的本发明的组合物。  The present invention provides a method of treating skin diseases, disorders, or conditions, including composition of the invention is transdermal administration to a patient in need of such treatment an effective amount. 在一个实施方案中，该皮肤疾病、障碍或病症为痤疮。 In one embodiment, the skin disease, disorder or condition is acne. 在另一实施方案中，该皮肤疾病、障碍或病症为牛皮癣。 In another embodiment, the skin disease, disorder or condition is psoriasis. 本发明还涉及本文所述的组合物在制备用于治疗皮肤疾病、障碍或病症的药物中的用途。  The present invention further relates to the use of compositions described herein in the manufacture of a medicament for the treatment of skin disease, disorder or disorder. 本发明还涉及治疗皮肤疾病、障碍或病症的方法，通过向需要该治疗的患者皮肤给药有效量的本发明的组合物。  The present invention further relates to a method of treating a skin disease, disorder or condition, the compositions of the present invention is administered through the skin of a patient in need of such treatment an effective amount. 可通过本发明的组合物治疗的示例的，非限制性的皮肤疾病、障碍或病症包括痤疮，酒渣鼻，皮炎，牛皮癣和真菌病。  available, non-limiting skin diseases, disorders or conditions include acne, rosacea, dermatitis, psoriasis and fungal diseases by way of example the treatment compositions of the present invention. 根据一个实施方案，该皮肤疾病、障碍或病症为痤疮。 According to one embodiment, the skin disease, disorder or condition is acne. 根据另一实施方案，该皮肤疾病、障碍或病症为牛皮癣。 According to another embodiment, the skin disease, disorder or condition is psoriasis. 在一个实施方案中，本发明的组合物与合适的其它药物剂型组合使用。  In one embodiment, the compositions of the invention in combination with other pharmaceutical formulations suitable use. 该其它药物剂型在本文所述的组合物之前、同时或之后给药。 The pharmaceutical dosage form other compositions described herein before, while or after administration. 在一个实施方案中，关于这一点，本发明组合物和其它药物剂型同时给药于患者。  In one embodiment, this regard, the compositions of the present invention and the other pharmaceutical dosage forms administered to a patient at the same time. 在另一个可选实施方案中，本发明的组合物和其它药物剂型之一在早晨给药而另一个在晚上给药。 In another alternative embodiment, one and other pharmaceutical dosage form composition of the present invention is administered in the morning and one evening administration. 在另一个实施方案中，该其它药物剂型可为合适的口服药物。  In another embodiment, the pharmaceutical dosage form may be other suitable oral medication. 在这方面，本发明组合物可在摄入口服药物之前、同时或之后施用至患者的目标区域。 In this regard, the compositions of the invention may be orally ingested drugs before, simultaneously with or after administration to a target region of the patient. 根据一个实施方案，本发明组合物包含类维生素A且口服药物剂型包含选自抗生素、避孕药、类维生素A如异维甲酸，和营养剂的药物活性剂。  According to one embodiment, the composition of the present invention comprises a retinoid A and oral pharmaceutical dosage form selected from the group comprising antibiotics, contraceptives, retinoids such as isotretinoin A, and pharmaceutically active agent is a nutritional agent. 以下实施例为优选实施方案的说明，且不是解释为限制本发明。  The following examples are to illustrate preferred embodiments, and is not to be construed as limiting the present invention. 所有百分比基于最终制备的递送系统或制剂的重量百分比，除非另有说明，且所有总量等于100重量％。 All percentages are based on weight percentages of the final delivery system or formulation prepared unless otherwise indicated and all totals equal 100% by weight. *在每100克气雾剂基质添加约7至8克AP70推进剂后，表2a和2b所述的制剂以泡沫分配。  * after the propellant is added per 100 grams of about 7-8 g AP70 propellant, Tables 2a and 2b of the formulation to foam dispensing. 1.在环境温度下在合适的不锈钢容器中将他扎罗汀溶解于己二酸二异丙基酯中(相2)。  1. at ambient temperature in a suitable stainless steel vessel tazarotene was dissolved in diisopropyl adipate ester (phase 2). 2.在环境温度下在不锈钢容器中制备缓冲溶液(相3)。  2. The buffer solution was prepared in a stainless steel vessel at ambient temperature (phase 3). 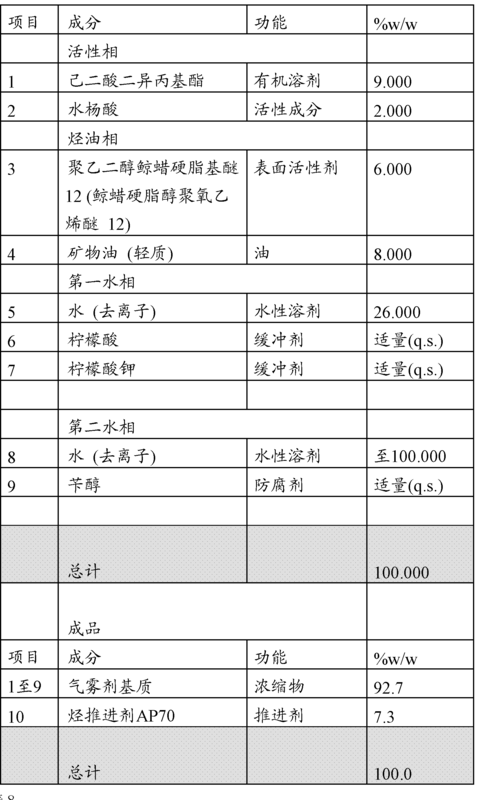 3.将油相成分添加至主批料容器中(相I)。  3. Add oil phase component to the main batch vessel (phase I). 4.在主批料容器中混合相1、相2和相3。  4. In the main mix vessel batch phase 1, phase 2 and phase 3. 开始在搅拌下低温加热。 Start heating with stirring at a low temperature. 继续加热至70 V至80 V的相转变温度范围直到油包水型乳液出现。 Heating was continued to 70 V to the phase transition temperature range up to 80 V water in oil emulsion occurs. 5.开始冷却至低于相转变温度。  5. Start cooled below the phase transition temperature. 当乳液变成水包油型亚微/微乳液时，在环境温度下以适中速率添加相4去离子水。 When the emulsion becomes oil-in-water submicron / microemulsion, at ambient temperature, was added at a moderate rate with 4 of deionized water. 搅拌直到均匀。 It was stirred until homogeneous. 在25°C-30°C下保持变成批料。 At 25 ° C-30 ° C to maintain the batch becomes. 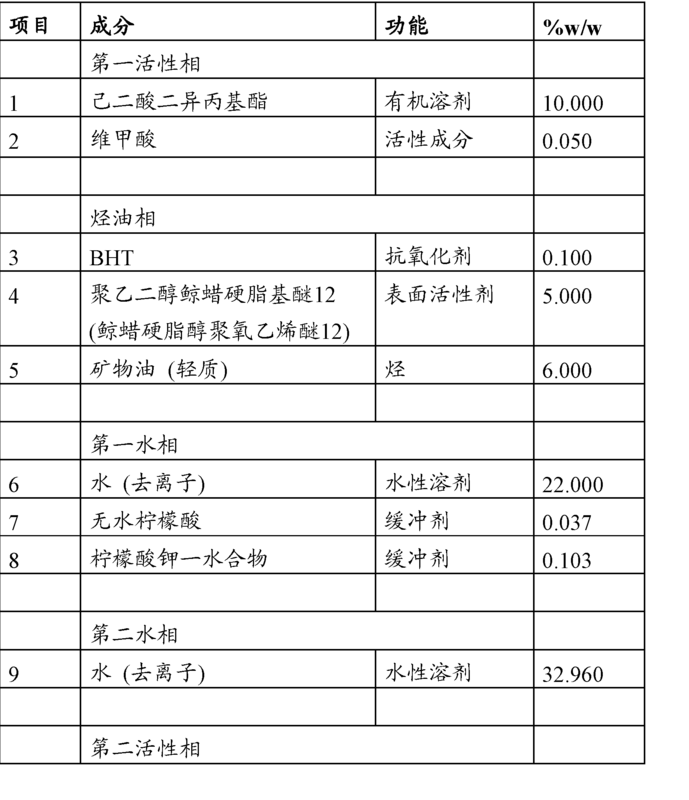 6.测试气雾剂基质的pH。  6. pH testing of propellant. 7.用IN氢氧化钾溶液或10%柠檬酸溶液调节pH至4.70至5.50的范围。  7. The pH is adjusted to a range of 4.70 to 5.50 with IN potassium hydroxide solution or 10% citric acid solution. 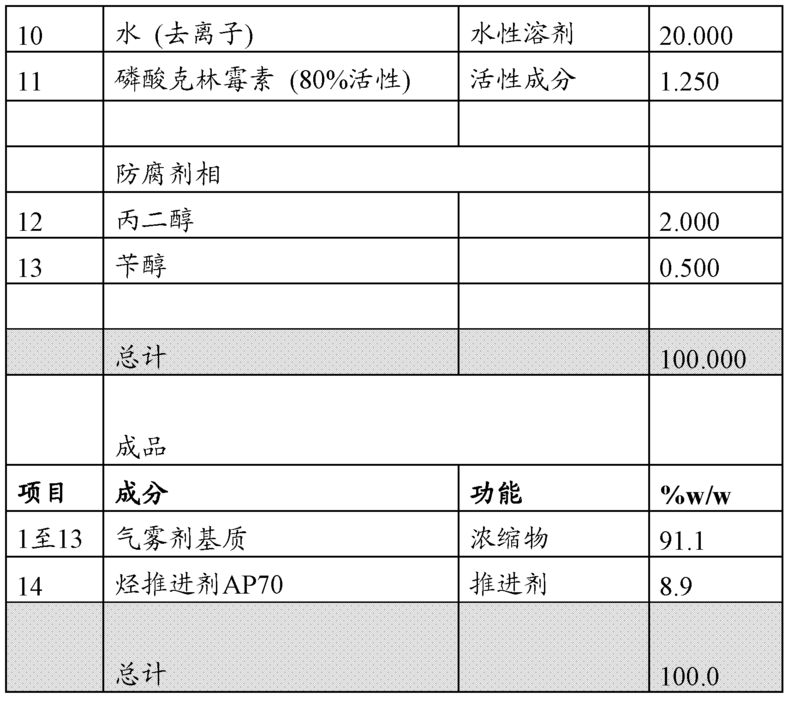 8.用去离子水调节至100% (补偿蒸发的水损失)。  8. adjusted with deionized water to 100% (compensate for evaporation loss of water). 上述方法在图1中以图解形式表示。  The methods represented in graphical form in FIG. 在环境温度，在次要容器中将他扎罗汀溶解于己二酸二异丙基酯，同时搅拌。  at ambient temperature in a secondary vessel of tazarotene was dissolved in diisopropyl adipate ester, while stirring. 添加矿物油和BHT至次要容器中，同时搅拌直到溶液均匀。  mineral oils and BHT added to the secondary vessel while stirring until the solution is homogeneous. 在环境温度下，添加去离子水(占气雾剂基质总水含量的约28.8% )，柠檬酸和柠檬酸钾至主批料容器中，同时搅拌直到所有成分完全溶解。  at ambient temperature, deionized water (representing approximately 28.8% of the total water content of the propellant), citric acid and potassium citrate to the main batch vessel, while stirring until all components completely dissolved. 添加山梨酸钾至主批料容器中，同时搅拌直到山梨酸钾完全溶解。  Potassium sorbate is added to the main batch vessel, while stirring until complete dissolution of potassium sorbate. 继续搅拌主批料容器的内含物且添加次要容器的内含物(他扎罗汀，DIPA，矿物油和BHT)至主批料容器中，然后添加山梨酸和鲸蜡硬脂醇聚氧乙烯醚-12。  Stirring was continued for the main contents of the batch vessel and adding the contents of the secondary container (tazarotene, of DIPA, mineral oil, and BHT) to the main batch vessel, then add the sorbic acid and cetyl hard tallow alcohol ethoxylates -12. 开始加热且继续加热直到达到相转变温度，即其中水包油型乳液转变成油包水型乳液(通过传导性或目视观察测量)。  heating was started and heating was continued until the phase transition temperature, i.e., wherein the oil in water type emulsion into a water in oil emulsion (visual observation or by measuring conductivity). 相转变温度范围为约70°C至约80°C。 Phase transition temperature in the range of about 70 ° C and about 80 ° C.
 冷却主批料容器至低于相转变温度(约69°C)以促进水包油型亚微/微乳液的形成。  The batch was cooled main container below the phase transition temperature (about 69 ° C) to promote the formation of submicron oil-in-water / microemulsion. 在环境温度下添加去离子水(占气雾剂基质总水含量的约71.2% )。  Deionized water was added at ambient temperature (representing approximately 71.2% of the total water content of the propellant). 继续搅拌且保持主批料容器在约25°C -30°C。 Stirring was continued and the vessel holding the master batch at about 25 ° C -30 ° C.
 测试pH且按需要调节至4.70至5.50的范围。  pH was tested and adjusted as necessary to a range of 4.70 to 5.50. 用去离子水调节以补偿蒸发的水损失。 Adjusted with deionized water to compensate for evaporation loss of water. 将气雾剂基质填充入合适的铝气雾剂容器中，插入合适的阀，真空卷曲且用合适的推进剂充气。  The propellant is filled into a suitable aerosol container of aluminum, is inserted into an appropriate valve, vacuum and crimped with a suitable propellant inflator. 制备亚微/微泡沫乳液-他扎罗汀(0.1 % )和卡泊三烯(0.005% )的方法气雾剂基质: 1.添加BHT(项目3)，鲸蜡硬脂醇聚氧乙烯醚-12(项目4)，矿物油(项目5)和生育酚(项目6)至主混合容器中。  Preparation of submicron / microfoam Emulsion - tazarotene (0.1%) and calcipotriene (0.005%) propellants method:  1. Add BHT (item 3), cetyl hard tallow alcohol ethoxylates -12 (item 4), mineral oil (item 5) and tocopherol (item 6) to the main mixing vessel. 2.通过将己二酸二异丙基酯(项目I)和他扎罗汀(项目2)添加至小混合容器中制备第一活性相，且混合直到他扎罗汀溶解。  2. By adipic acid isopropyl ester (item I) and tazarotene (item 2) added to the first active phase preparative small mixing vessel and mixed until dissolved tazarotene. 3.将第一活性相溶液(项目I和2)添加至主混合容器中。  3. The solution of the first active phase (item I and 2) added to the main mixing vessel. 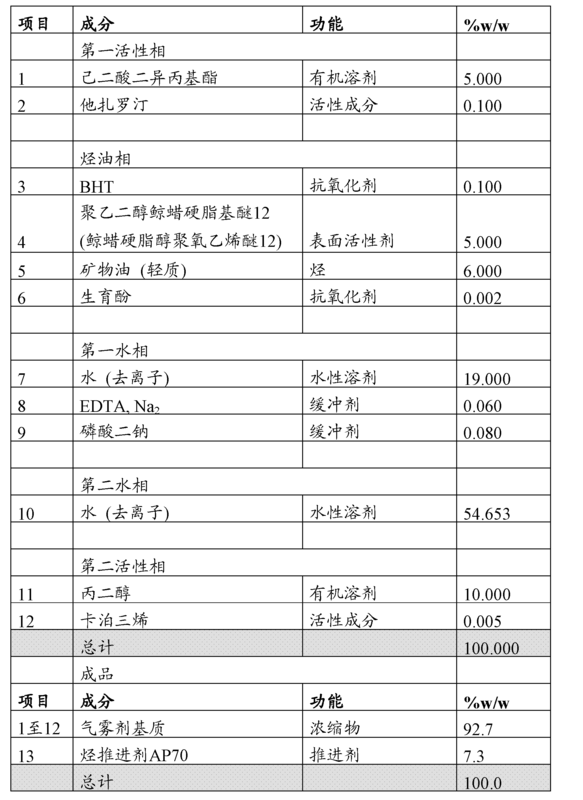 4.通过向单独的混合容器中添加水(项目7)制备第一水相.。  4. by (item 7) preparing a first water adding water to phase separate mixing vessel ..
 5.开始搅拌第一水相并将EDTA、Na2 (项目8)和磷酸二钠(项目9)添加至水中且混合直到溶解。  5. Start stirring the first phase and the aqueous EDTA, Na2 (item 8) and disodium phosphate (item 9) was added to water and mixed until dissolved. 6.添加第一水相(项目7至9)至主混合容器中。  6. Add the first aqueous phase (Items 7 to 9) to the main mixing vessel. 7.当监测主混合容器内含物(项目I至9)的传导性时，开始加热至约80°C，并开始搅拌。 When  7. When the monitor main mixing vessel contents (items I to 9) conductivity, begin heating to about 80 ° C, and stirring was started. 8.随着温度增加，混合物从水包油型乳液转变成油包水型乳液，且观察到传导性的相应降低。  8. As the temperature increases, the mixture was converted from a water-oil emulsion to an oil-in-water type emulsion, and a corresponding decrease in the observed conductivity. 9.当温度达到约80°C时，停止加热且开始缓慢冷却主混合容器中的内含物，同时保持搅拌。  9. When the temperature reached about 80 ° C, heating was stopped and slowly cooling the main contents of the mixing vessel, while maintaining stirring. 10.在约70°C，该混合物从油包水型乳液转变成水包油型乳液，且观察到传导性的相应增加。  10. at about 70 ° C, the mixture turned from water-in-oil emulsion to oil-inwater emulsion was observed and the corresponding increase in conductivity. 混合物的外观也从不透明变为半透明。 Appearance mixtures also change from opaque to translucent. 11.在该温度，当混合物为半透明时，将第二水相(项目10)在环境温度下添加至主混合容器中，且继续搅拌。  11. When the mixture is translucent, the second aqueous phase (item 10) is added at this temperature at ambient temperature to the main mixing vessel, and stirring was continued. 添加第二水相后混合物的温度将降低至约40°C。 After the second aqueous phase is added to reduce the temperature of the mixture to about 40 ° C.
 12.当搅拌混合物时，继续冷却直到温度范围降低至约25°C至30°C。  12. When the mixture was stirred, with continued cooling until the temperature is lowered to the range of about 25 ° C to 30 ° C.
 13.通过将丙二醇(项目11)和卡泊三烯(项目12)添加至小混合容器中制备第二活性相，且混合直到卡泊三烯溶解。  13. by propylene glycol (item 11) and calcipotriene (item 12) to a small mixing vessel prepared in a second active phase, calcipotriene and mixed until dissolved. 14.将第二活性相(项目11和2)转移至主混合容器中且搅拌直到混合物均匀。  14. The second active phase (items 11 and 2) is transferred to the main mixing vessel and stirred until the mixture was homogeneous. 1.添加气雾剂基质(项目I至12)至空的气雾剂容器中。  1. Add propellant (Item I-12) to an empty aerosol container. 2.将在气雾剂容器上的气雾剂阀关紧。  2. The aerosol valve on the aerosol container tightly closed. 3.添加推进剂(项目13)至气雾剂容器中。  3. Add the propellant (Item 13) into an aerosol container. 4.测试该气雾剂容器以证实没有泄漏。  4. The test confirmed that no leakage of the aerosol container. 5.将致动器安置在气雾剂阀上。  The actuator is disposed on the aerosol valve. 6.在室温，散布前摇动气雾剂容器。  6. at room temperature, shaking the aerosol container before spreading. 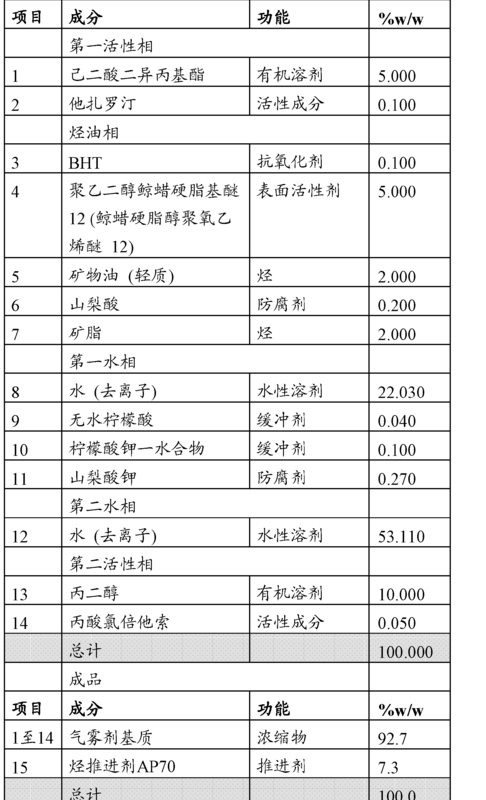 1.添加BHT (项目3)，鲸蜡硬脂醇聚氧乙烯醚_12 (项目4)和矿物油(项目5)至主混合容器中。  1. Add BHT (item 3), cetostearyl alcohol polyoxyethylene ethers _12 (item 4) and mineral oil (item 5) to the main mixing vessel. 2.通过将(项目1)和维甲酸(项目2)添加至小混合容器中制备第一活性相，且混合直到溶解。  2. By (item 1) and retinoic acid (item 2) added to the first active phase preparative small mixing vessel and mixed until dissolved. 4.通过向单独的混合容器中添加水(项目6)制备第一水相。  4. (Item 6) preparing a first aqueous phase by adding water to a separate mixing vessel. 5.开始搅拌第一水相并将无水朽1檬酸(项目7)和朽1檬酸钾一水合物(项目8)添加至水中且混合直到溶解。  5. Start stirring the first phase and aqueous citric acid anhydrous rot 1 (item 7) and a lemon rot potassium monohydrate (item 8) was added to water and mixed until dissolved. 6.添加第一水相(项目6至8)至主混合容器中。  6. Add the first aqueous phase (Item 6-8) to the main mixing vessel. 7.当监测主混合容器内含物(项目I至8)的传导性时，开始加热至约80°C，并开始搅拌。 When  7. When the contents of the main mixing vessel monitoring (item I to 8) conductivity, begin heating to about 80 ° C, and stirring was started. 9.混合物从水包油型乳液转变成油包水型乳液后，停止加热且开始缓慢冷却主混合容器的内含物，同时保持搅拌。  9. After the mixture turned from water type emulsion into a water-in-oil emulsion, the heating was stopped and slowly cooling the contents of the main mixing vessel while maintaining stirring. 10.在冷却下，该混合物从油包水型乳液转变回为水包油型乳液，且观察到传导性的相应增加。  10. Under cooling, the mixture was converted from a water-in-oil emulsion of oil in water back to the emulsion, and the corresponding increase was observed conductivity. 混合物的外观也从不透明变为半透明。 Appearance mixtures also change from opaque to translucent. 11.在该温度，当混合物为半透明时，在环境温度添加第二水相(项目9)至主混合容器中，且继续搅拌。  11. At this temperature, when the mixture is translucent, at ambient temperature was added a second aqueous phase (item 9) to the main mixing vessel, and stirring was continued. 添加第二水相后混合物的温度将降低。 After the second aqueous phase added to reduce the temperature of the mixture. 12.当搅拌该混合物时，持续冷却直到温度范围降低至约25°C至30°C。  12. When the mixture was stirred continuously until cooling to reduce the temperature in the range of about 25 ° C to 30 ° C.
 13.通过将水(项目10)和磷酸克林霉素(项目11)添加至小混合容器中制备第二活性相，且混合直到磷酸克林霉素溶解。  13. water (item 10) and the clindamycin phosphate (item 11) by adding to the second active phase preparative small mixing vessel and mixed until dissolution of clindamycin phosphate. 14.将第二活性相(项目10和11)转移至主混合容器中，且搅拌直到混合物均匀。  14. The second active phase (items 10 and 11) is transferred to the main mixing vessel and stirred until the mixture was homogeneous. 15.通过将丙二醇(项目12)和苄醇(项目13)添加至小混合容器中制备防腐剂相，且混合直到均匀。  15. glycol (item 12) and benzyl alcohol (item 13) by adding to a small mixing vessel preparation preservatives, and mixed until uniform. 16.将防腐剂相(项目12和13)转移至主混合容器中且搅拌直到混合物均匀。  16. The preservatives (items 12 and 13) is transferred to the main mixing vessel and stirred until the mixture was homogeneous. 1.添加气雾剂基质(项目I至13 )至空的气雾剂容器中。  1. Add propellant (Item I-13) to an empty aerosol container. 3.添加推进剂(项目14)至气雾剂容器中。  3. Add the propellant (Item 14) into an aerosol container. 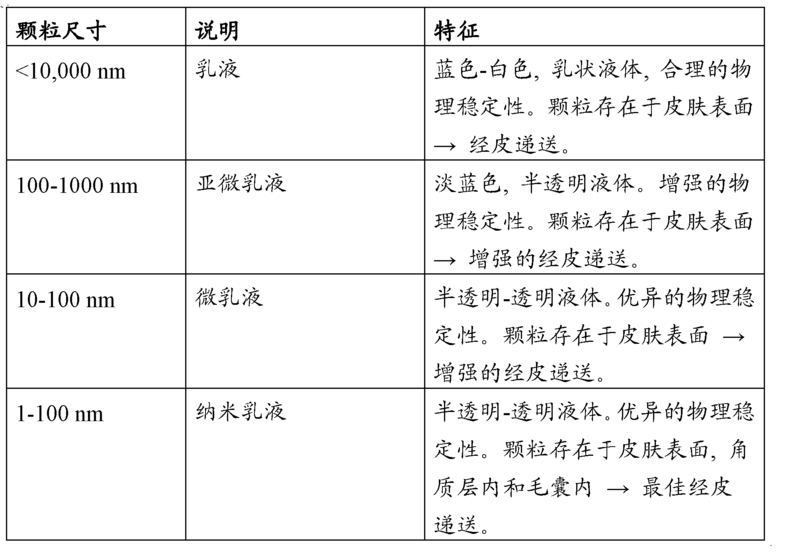 表5至9中所述的制剂为本发明的进一步说明。 In the formulation  Table 5-9 of the present invention are further illustrated. 进行皮肤渗透研究，使用体外皮肤分布测试比较实施例2a和2b的他扎罗汀亚微/微泡沫乳液(基质)制剂与TAZORAC™乳膏和凝胶制剂的局部递送。  Skin permeation study, using an in vitro skin Distribution Test Examples 2a and 2b tazarotene micro / micro-foam emulsion (matrix) TAZORAC ™ topical cream formulation and deliver the formulation in Comparative Example gels. 分层厚皮(split-thickness skin)(〜0.50mm)切片安置在流通扩散池中，且测试试剂以15.63mg/cm2的限定剂量涂覆于3个皮肤供体上，每个重复5次。  Layered thick (split-thickness skin) (~0.50mm) sections disposed in the flow diffusion cell, and a test agent to define a dose 15.63mg / cm2 is applied to the skin on the three donors, each repeat 5 times. 在不同时间点(t = 0,2,6hrs)收集组织,洗漆,带剥离(tape stripped),且分裂为表皮和真皮。  collected at different time points (t = 0,2,6hrs) tissue removers, peeling tape (tape stripped), and split into epidermis and dermis. 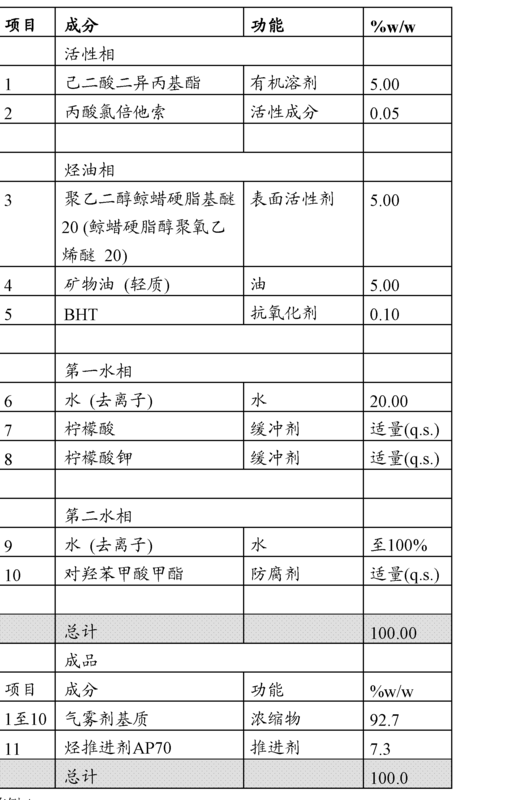 他扎罗汀在表皮、真皮以及洗液中的分布用50pg/mLL0Q通过LC/MS/MS确定。 Tazarotene in the epidermis, dermis and lotion distribution with 50pg / mLL0Q LC / MS / MS by the determined. 如图2和3所示，他扎罗汀泡沫(基质)制剂在表皮和真皮中的皮肤渗透类似于商业比较制剂(即TAZORAC®乳膏和凝胶)。  Figures 2 and 3, tazarotene foam (matrix) epidermis and dermis in preparation for skin penetration similar to the commercial comparative formulation (i.e. TAZORAC® creams and gels). 在50°C进行加速的稳定性研究(使用HPLC)以测量他扎罗汀与各种表面活性剂的相容性。  Accelerated stability studies (using HPLC) to measure the 50 ° C and tazarotene compatibility with various surfactants. 图4和5显示他扎罗汀在亲水性乙氧基化脂肪醇醚表面活性剂，如鲸蜡硬脂醇聚氧乙烯醚-12中最稳定,与各种亲油性表面活性剂相反。 4 and 5 show tazarotene hydrophilic ethoxylated fatty alcohol ether surfactants, such as cetyl alcohol, stearyl polyoxyethylene ether -12 most stable, in contrast to a variety of lipophilic surfactants. 使用Malvern Mastersizer 2000仪器测量本发明的亚微/微乳液(泡沫气雾剂基质)的油相的颗粒尺寸分布。 Particle size  measured using Malvern Mastersizer 2000 apparatus of the present invention submicronic microemulsion (foam propellant) oil / phase distribution. 图6说明优选制剂(730/2/1)的油相的颗粒尺寸分布。 6 illustrates a preferred formulation particle size (730/2/1) oil phase distribution. 平均颗粒尺寸为0.097111 11，8卩，约0.1iim(即约IOOnm)。 The average particle size of 11.8 0.097111 Jie, about 0.1iim (i.e. about IOOnm). 1.水包油型乳液泡沫气雾剂组合物，其包含油相和水相，所述组合物包含: i)他扎罗汀， ii)水，其量为65%至90重量％， iii)油，其存在量少于10重量％， iv)油可混溶的有机溶剂， V)包含亲水性表面活性剂的表面活性剂成分，其量为0.1%至10重量％，和vi)推进剂；且其中所述他扎罗汀溶解于该组合物的油相中，且其中油相的颗粒尺寸小于lOOOnm。 1. Oil in water emulsion aerosol foam composition comprising an oil phase and an aqueous phase, said composition comprising: i) tazarotene, ii) water in an amount of from 65% to 90 wt%, iii ) oil which is present less than 10 wt%, IV) an oil-miscible organic solvent, V) a hydrophilic surfactant component comprising a surfactant in an amount of from 0.1% to 10% by weight, and vi) propellant; and wherein the tazarotene is dissolved in the oil phase of the composition, and wherein the particle size of the oil phase is less than lOOOnm. 2.根据权利要求1的泡沫气雾剂组合物，其中所述组合物包含70%至85重量％的水。 The aerosol foam composition of claim 1, wherein said composition comprises from 70 to 85% by weight of water. 3.根据权利要求1或2的泡沫气雾剂组合物，其中所述油选自甘菊环，菊奥，异链烷烃，直链α烯烃，亚环己基二苯基甲烷，二癸烯，二乙基己基环己烷，二十烷，异十二烷，异二十烷，异十六烷，长叶烯，矿物油，石蜡，五氢角鲨烯，矿脂，角鲨烷，角鲨烯，十四烯，及其混合物。 The aerosol foam composition 1 or 2, wherein said oil is selected from azulene, chrysanthemum Austria, isoparaffins, linear α-olefin, cyclohexylene diphenylmethane, bis claim decene, diethyl hexyl cyclohexane, eicosane, isododecane, isoeicosane, isohexadecane, longifolene, mineral oil, paraffin, pentahydrosqualene squalene, petrolatum, squalane, squalene , tetradecene, and mixtures thereof. 4.根据权利要求3的泡沫气雾剂组合物，其中所述油为矿物油。 4. The aerosol foam composition of claim 3, wherein said oil is a mineral oil. 5.根据权利要求1的泡沫气雾剂组合物，其中所述油的存在量为1%至9重量％。 The aerosol foam composition according to claim 1, wherein said oil is present in an amount of 1% to 9% by weight. 6.根据权利要求5的泡沫气雾剂组合物，其中所述油的存在量为3%至8重量％。 6. The aerosol foam composition according to claim 5, wherein said oil is present in an amount of from 3% to 8% by weight. 7.根据权利要求1的泡沫气雾剂组合物，其中该油可混溶的有机溶剂选自己二酸二异丙基酯，肉豆蘧酸异丙酯，辛基十二烷醇和甘油三辛酸/癸酸酯，及其混合物。 The aerosol foam composition of claim 1, wherein the oil-miscible organic solvent is selected from isopropyl esters of adipic, myristoyl Qu isopropyl myristate, octyldodecanol and caprylic acid triglyceride / caprate, and mixtures thereof. 8.根据权利要求1的泡沫气雾剂组合物，其中所述表面活性剂成分包含亲水性乙氧基化脂肪醇醚。 8. The aerosol foam composition of claim 1, wherein the surfactant component comprises a hydrophilic ethoxylated fatty alcohol ether. 9.根据权利要求8的泡沫气雾剂组合物，其中所述表面活性剂成分包含亲水性乙氧基化脂肪醇醚，且基本上不含，或不含亲油性表面活性剂。 9. The aerosol foam composition of claim 8, wherein the surfactant component comprises a hydrophilic ethoxylated fatty alcohol ethers, and is substantially free, or free of lipophilic surfactant. 10.根据权利要求8或9的泡沫气雾剂组合物，其中所述亲水性乙氧基化脂肪醇醚选自硬脂基聚氧乙烯醚-10，硬脂基聚氧乙烯醚-20，鲸蜡硬脂醇聚氧乙烯醚_6，鲸蜡硬脂醇聚氧乙烯醚-10，鲸蜡硬脂醇聚氧乙烯醚-12，鲸蜡硬脂醇聚氧乙烯醚-15，鲸蜡硬脂醇聚氧乙烯醚-20，鲸蜡硬脂醇聚氧乙烯醚-21，鲸蜡硬脂醇聚氧乙烯醚-22，鲸蜡硬脂醇聚氧乙烯醚-25，鲸蜡硬脂醇聚氧乙烯醚-30，鲸蜡硬脂醇聚氧乙烯醚-31，鲸蜡硬脂醇聚氧乙烯醚-32，鲸蜡硬脂醇聚氧乙烯醚-33，月桂基聚氧乙烯醚_5，月桂基聚氧乙烯醚_9，月桂基聚氧乙烯醚-10，月桂基聚氧乙烯醚-12，月桂基聚氧乙烯醚-15，月桂基聚氧乙烯醚-20，月桂基聚氧乙烯醚-21，月桂基聚氧乙烯醚-22，月桂基聚氧乙烯醚-23，壬基酚聚氧乙烯醚-9，油基聚氧乙烯醚-10，油基聚氧乙烯醚-20，及其混合物。 10. The aerosol foam composition according to claim 8 or 9, hydrophilic ethoxylated fatty alcohol is selected from stearyl -10 polyoxyethylene ether, stearyl polyoxyethylene ether in claim -20, wherein said cetearyl alcohol _6 polyoxyethylene ethers, cetostearyl alcohol -10 polyoxyethylene ethers, cetostearyl alcohol polyoxyethylene ethers 12, cetostearyl alcohol polyoxyethylene ethers -15, whale cetearyl alcohol ether, polyoxyethylene-20, ceteareth -21 polyoxyethylene ethers, cetostearyl alcohol polyoxyethylene ethers -22, cetearyl alcohol polyoxyethylene ethers -25, cetyl hard tallow alcohol ethoxylates -30, ceteareth -31 polyoxyethylene ethers, cetostearyl alcohol -32 polyoxyethylene ethers, cetostearyl alcohol -33 polyoxyethylene ethers, polyoxyethylene lauryl _5 ether, polyoxyethylene lauryl ether _9, polyoxyethylene lauryl ether, -10, polyoxyethylene lauryl ether 12, polyoxyethylene lauryl ether, -15, polyoxyethylene lauryl ether, -20, lauryl -21-yl polyoxyethylene ether, lauryl polyoxyethylene ether, -22, polyoxyethylene lauryl ether, -23, -9 polyoxyethylene nonylphenyl ether, polyoxyethylene oleyl ether, -10, polyoxyethylene oleyl -20 ethers, and mixtures thereof. 11.根据权利要求10的泡沫气雾剂组合物，其中所述亲水性乙氧基化脂肪醇醚为鲸蜡硬脂醇聚氧乙烯醚-12。 11. The aerosol foam composition of claim 10, wherein the hydrophilic ethoxylated fatty alcohol ether of cetearyl alcohol polyoxyethylene ethers -12. 12.根据权利要求1的泡沫气雾剂组合物，其中所述表面活性剂成分的存在量为1%至8重量％。 12. The aerosol foam composition according to claim 1, wherein the surface active agent component is present in an amount of 1% to 8% by weight. 13.根据权利要求12的泡沫气雾剂组合物，其中所述表面活性剂成分的存在量为2%至6重量％。 13. The aerosol foam composition according to claim 12, wherein the surface active agent component is present in an amount of from 2% to 6% by weight. 14.根据权利要求1的泡沫气雾剂组合物，其中所述推进剂包括一种或多种烃推进剂。 14. The aerosol foam composition according to claim 1, wherein said one or more propellants include hydrocarbon propellants. 15.水包油型乳液泡沫气雾剂组合物，其包含油相和水相，所述组合物包含:i)他扎罗汀； ii)水，其量为70%至85重量％; iii)油，其存在量为3%至8重量％; iv)油可混溶的有机溶剂； V)包含亲水性表面活性剂的表面活性剂成分，其量为2%至6重量％; 和vi)烃推进剂；和其中所述他扎罗汀溶解于组合物的油相中，且其中油相的颗粒尺寸小于lOOOnm。 15. Oil in water emulsion aerosol foam composition comprising an oil phase and an aqueous phase, said composition comprising: i) tazarotene; ii) water in an amount of from 70 to 85 wt%; iii ) oil which is present in an amount of 3% to 8% by weight; IV) an oil-miscible organic solvent; V) a hydrophilic surfactant component comprises a surfactant in an amount from 2% to 6% by weight; and vi) hydrocarbon propellant; and wherein the tazarotene is dissolved in the oil phase of the composition, and wherein the particle size of the oil phase is less than lOOOnm. 16.根据权利要求1至15任一项的组合物在制备用于治疗皮肤疾病、障碍或病症的药物中的用途。 16. A composition according to any one of claims 1 to 15 in the manufacture of a medicament for the treatment of skin disease, disorder or disorder. 17.制备水包油型亚微乳液或微乳液泡沫气雾剂组合物的方法，所述组合物包含他扎罗汀、其量为65%至90重量％的水、存在量少于10重量％的油、油可混溶的有机溶剂、0.1%至10重量％的包含亲水性表面活性剂的表面活性剂成分、和推进剂，该方法包括: a)混合所述他扎罗汀、第一等分部分的水、油、油可混溶的有机溶剂和表面活性剂成分以形成水包油型乳液， b)加热步骤(a)的水包油型乳液至相转变温度，其中该水包油型乳液形成油包水型乳液， c)冷却该油包水型乳液至低于相转变温度以形成亚微或微水包油型乳液， d)添加第二等分部分的水以冷却亚微或微水包油型乳液， e)用推进剂推进亚微或微水包油型乳液的样品以形成水包油型亚微乳液或微乳液泡沫气雾剂。 The method of submicron oil-in-water emulsion or microemulsion aerosol foam 17. A composition prepared, the composition contains tazarotene in an amount of 65% to 90% by weight of water, the presence of less than 10 wt. % surfactant component of an oil, oil-miscible organic solvent, 0.1% to 10% by weight comprising a hydrophilic surfactant, and a propellant, the method comprising: a) mixing the tazarotene, a first aliquot of water, oil, oil-miscible organic solvent and a surfactant component portion to form an oil in water type emulsion, b) the heating step (a) is an oil in water emulsion to the phase transition temperature, wherein the oil in water type emulsion water-in-oil emulsion is formed, c) cooling the oil in water type emulsion to below the phase transition temperature to form submicron or micro-water type emulsion, d) adding water to the second aliquot cooling or sparingly water submicron type emulsion, e) propulsion propellants submicron or micro-emulsion of oil-in-water sample to form an oil-in-water submicron emulsion or microemulsion aerosol foam. 18.根据权利要求17的方法，其中所述第一等分部分的水占亚微乳液或微乳液泡沫气雾剂的总水含量的10%至40重量％，且所述第二等分部分的水占亚微乳液或微乳液泡沫气雾剂的总水含量的90%至60重量％。 18. The method according to claim 17, wherein said first aliquot portion of the water 10% to 40% by weight of the total water content submicron emulsion or microemulsion aerosol foam, and the second aliquot water 90% to 60% by weight of the total water content submicron emulsion or microemulsion aerosol foam. 19.通过根据权利要求17或18的方法制备的产物。 19. A product prepared by the process according to claim 17 or 18. MX2011008984A (en) * 2011-08-25 2013-02-25 Genomma Lab Internacional S A B De C V Composition for the percutaneous administration of active compounds providing a suitable treatment for androgenetic alopecia. MX2017014804A (en) 2015-05-21 2018-02-15 Glaxosmithkline Ip Dev Ltd Topical pharmaceutical compositions. MXPA06008988A (en) 2006-08-08 2008-02-07 Fernando Ahumada Ayala Topical antiacne preparations containing retinoid (tazarotene or adapalene), antibiotic (clindamycin phosphate) and/or keratolytic (miscrosponged benzoyl peroxide).